Another first was Exhibitors from Interstate. 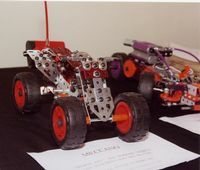 Malcolm Booker came down from Sydney with a car load of models which added substantially to the high quality of the display. 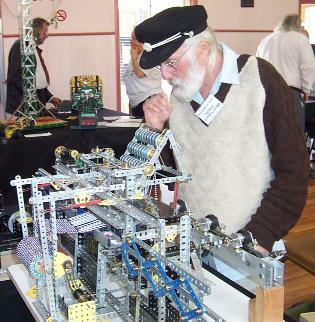 For those who do not know him well, Malcolm is a well known Meccanoman both in Australia and overseas. He has just stepped down from a position on the Committee of The International Society of Meccanomen. 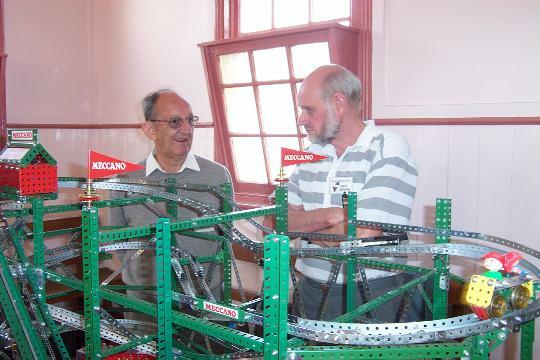 A second visitor was Paul Dale from Queensland who will be known to many as organiser of the Spanner email discussion group, which provides an electronic forum for discussion of Meccano matters worldwide. Another visitor, Brad Johnson came down with Paul. 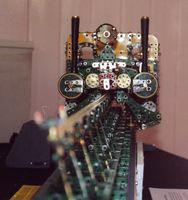 Brad is not particularly a Meccanoman, but is an excellent photographer especially of Meccano models! Brad has very kindly made his pictures available for inclusion on the magazine and I have made use of several. Thank you Brad. The Club is very pleased that all three were able to come and thanks them most sincerely for their attendance. It does make a difference to be able to chat to Meccanomen from other parts from time to time. 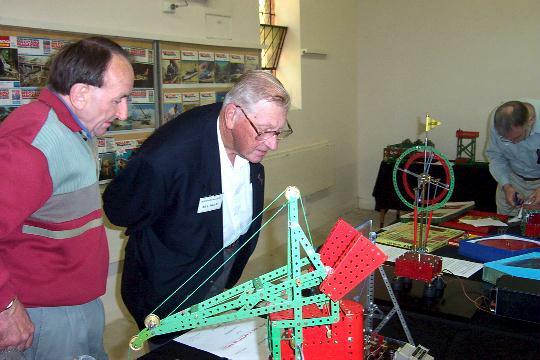 As well the Club would like to thank the members of the Exhibition Committee and particularly its Chairman Kimball Monger for the work they did in making this Exhibition the outstanding success it was. 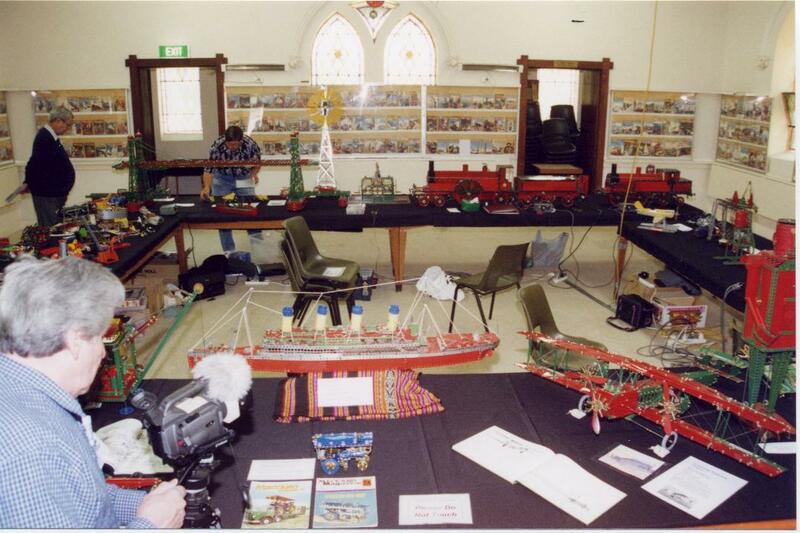 But the most important people of all to thank are the members who brought along models to exhibit - without them there wouldn't have been a show! (as he has done for our last two exhibitions). Inside the Main Hall the models had been set up around the perimeter of a hollow square in the middle of the room. It was a slow and exhausting but interesting and fascinating job to move right around to try and see everything! 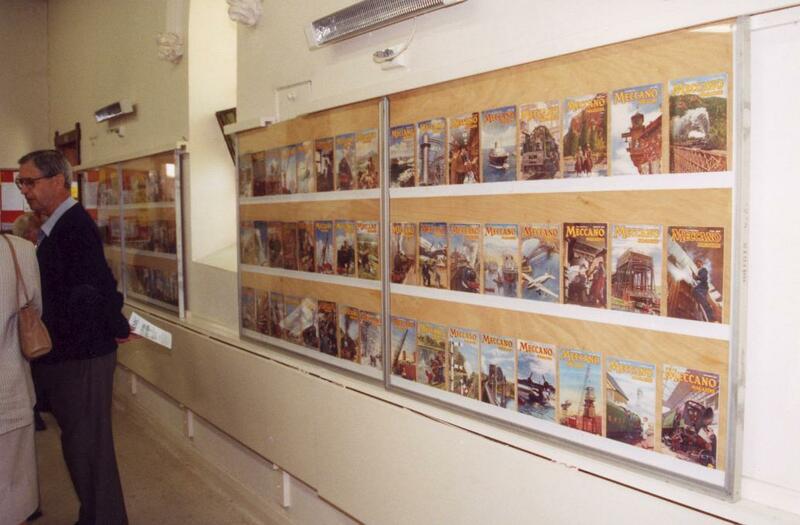 Another imposing display in the Main Hall was a magnificent arrangement of post war Meccano magazines around three walls of the hall. This was done by Bruce Douglas and continues a tradition which he initiated for our first exhibition at Gardenvale two years ago. The first model display that visitors saw as they came in (they could hardly miss it!) 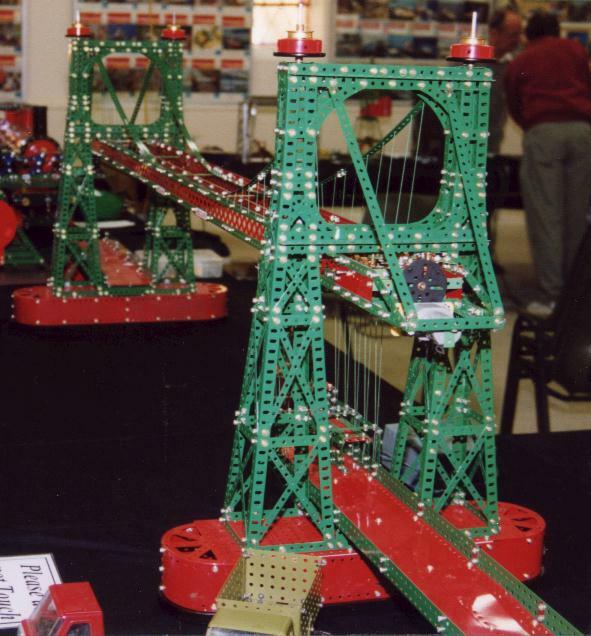 was Barry McDonald's model of the Runcorn Transporter Bridge. It was most impressive and over 2 m long. 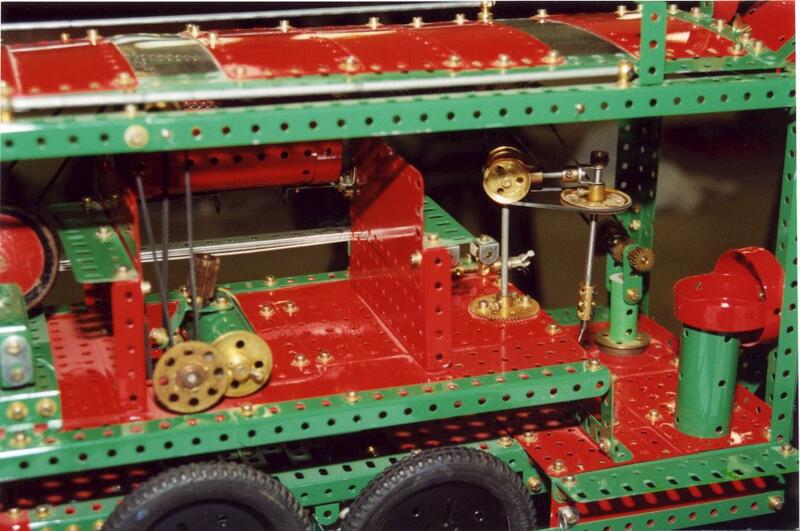 Barry's model was based on that described in the No 10 manual of 1937 but with numerous improvements. 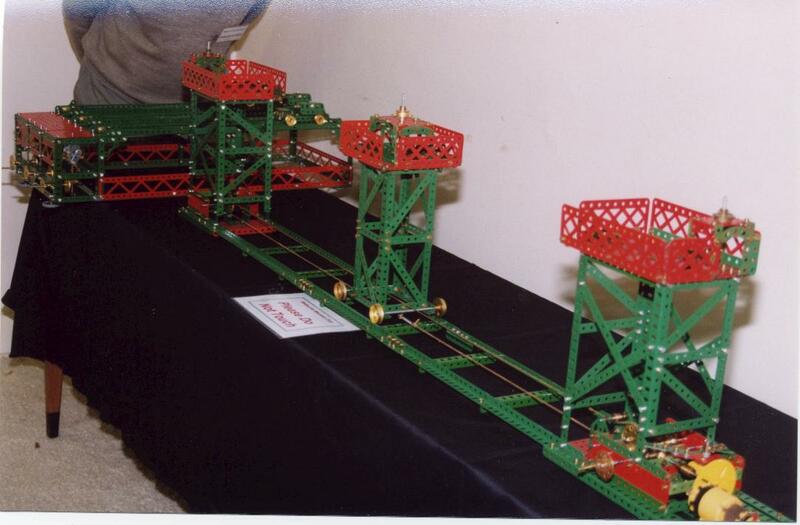 These included the use of braced girders along the superstructure, much improved proportions for the supporting towers at either end and a more realistic car. To complete the scene Barry had a small Meccano ship (from the No 4 manual of 1954) sailing in the river next to the bridge. The Runcorn Bridge was constructed in the early years of last century across the River Mersey and the Manchester Ship Canal. It remained in service until the 1960's when a high level single arch steel bridge was built to replace it. According to the locals, crossing on the old transporter could be quite an adventure. The span was about 300 m and the car could sway alarmingly in windy conditions. Two examples of transporter bridges (both operating) still exist in Britain , one at Newport (South Wales) and the other at Middlesbrough (NE England). By way of contrast Barry had a second example, the St-Malo Transporter Bridge in Brittany. 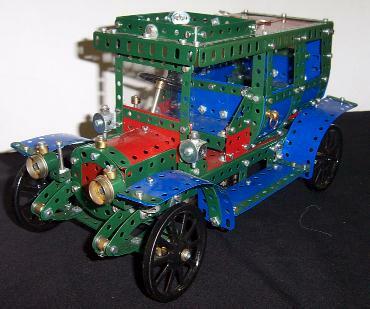 This model was originally described in the Meccano Magazine (May-June 1919). This is an excellent representation of the Rolling Bridge which conveys passengers from St-Malo to St-Servan. 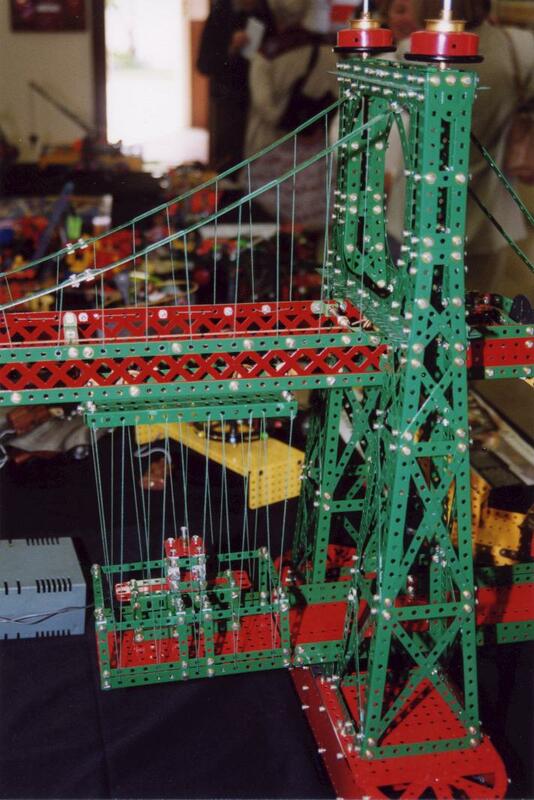 It is much less costly to construct than a transporter bridge of the Newport type, but of course it can only be used over marshy land with shallow water, over which a solid track can be laid. 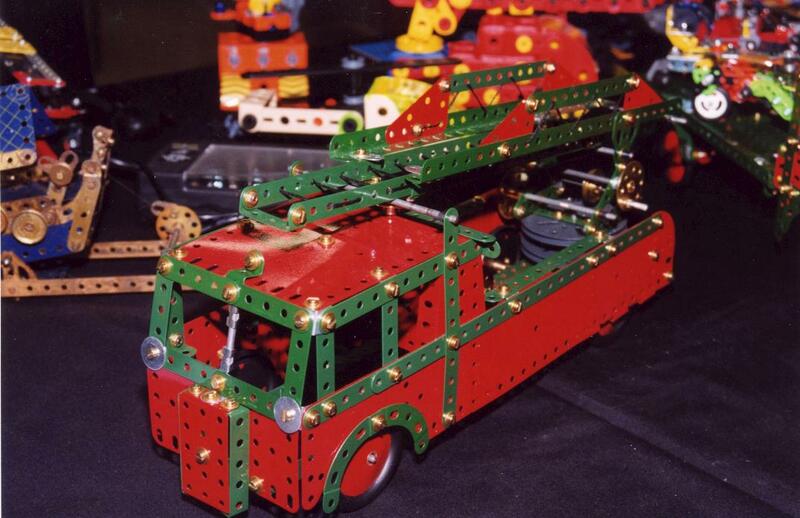 The clever Meccano boy will know how to add a little decorations to the transporter and the landing platform, in the way of flags, &c., and make a first-class toy of this fine model. Typically there were no written instructions for building the model, but rather a well-composed line drawing. 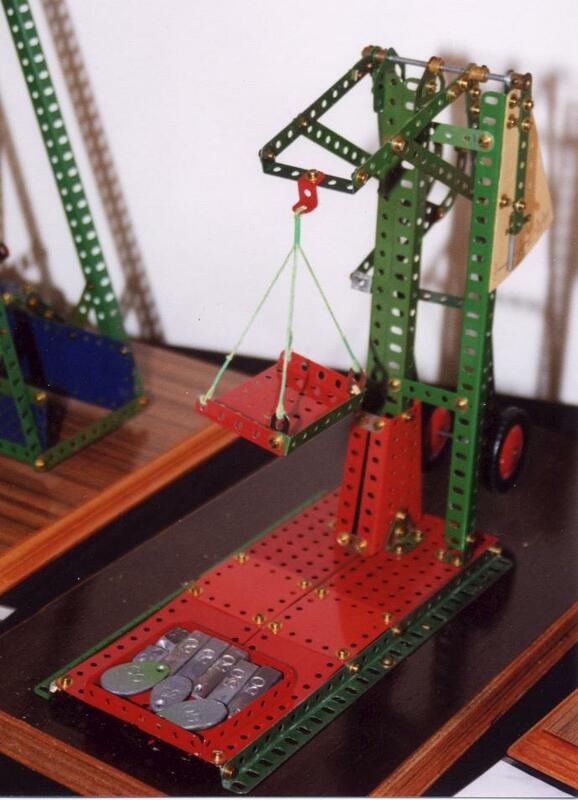 * Tug o' War game, a fascinating model that provided plenty of entertainment for our visitors. 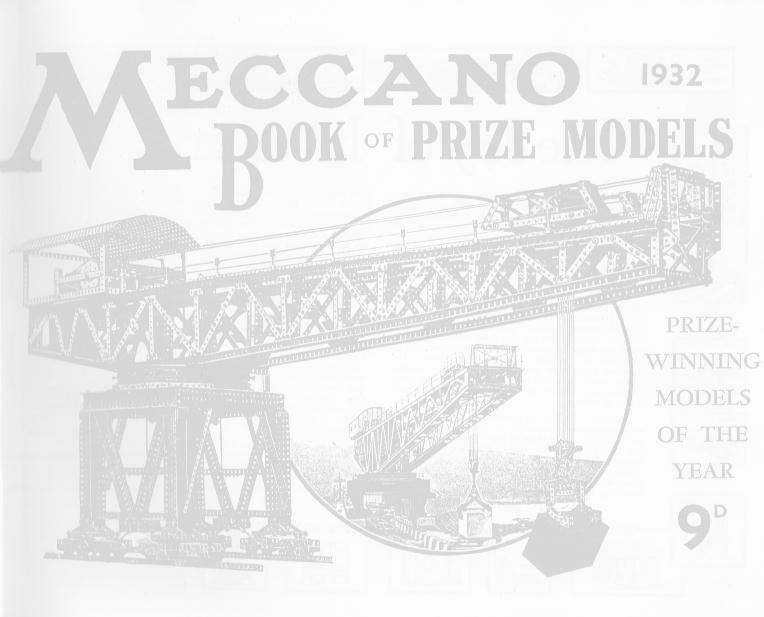 * The Race-a-Way (a second hands-on game) designed by H Procter that appeared in the Meccano Magazine of September 1931. Up to four competitors race one another to move their trolley from one end to the other. 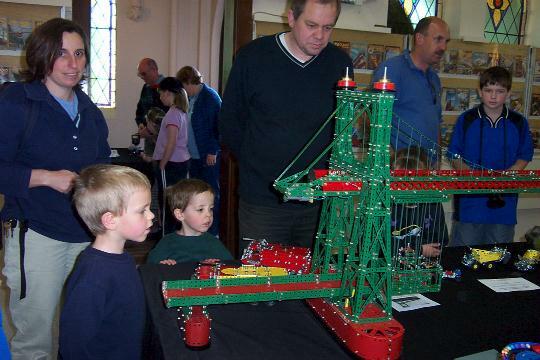 It was a great hit with the children and it is a tribute to Barry's sturdy construction that they did not seem able to wreck it! * Mechanical Horse and Trailer from the 1950's No 6 Manual. * Aircraft Crash Tenders from the Master Builders and Evolution sets of the 1990's. * Models from the Multikits of the 1970's. 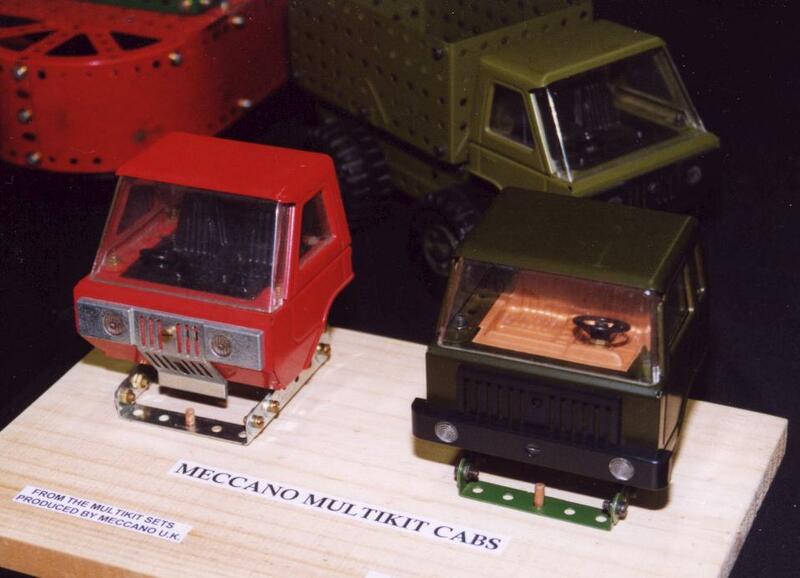 These sets were launched at the Brighton Toy Fair of January 1973 and added a degree of realism to Meccano modelling with the complete lorry cab assembly. The range consisted of the Army, Highway, Superhighway and the Combat Multikit . All in all it was a very attractive and interesting display Barry. Thank you very much for bringing it all the way from Colac for everyone to enjoy. 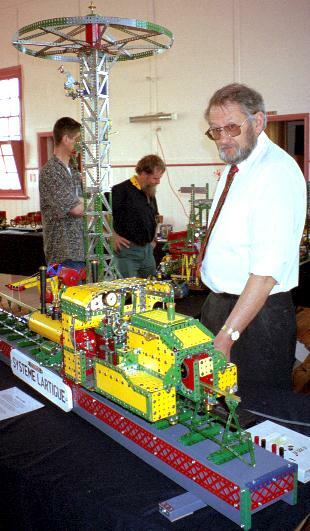 Roger and Sandra Hall had an extensive collection of smaller models. 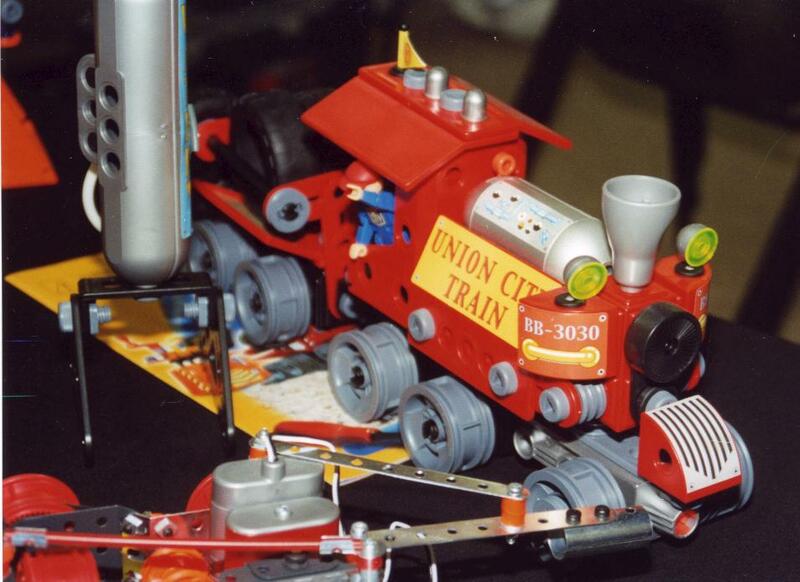 These were mostly from the 1990's and later sets and included three models from the Crazy Inventors' Series, The Bat, Steamship and Rattletrap. 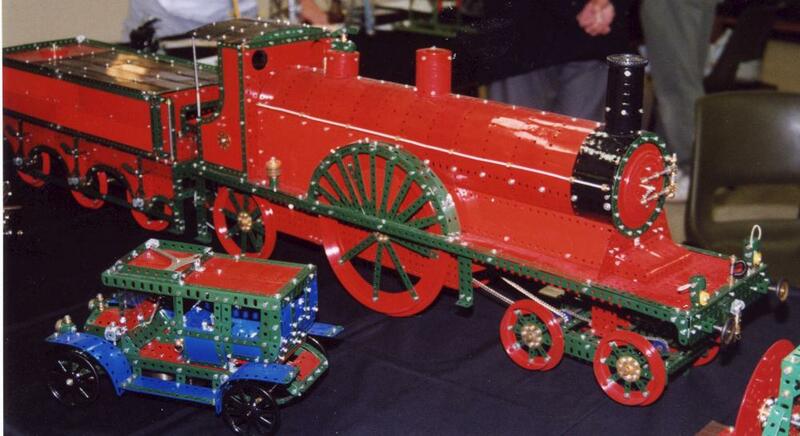 As well Roger displayed the Locomotive from the Special Edition Train Set. This set is "hot off the press" having been available in the shops only since August this year. 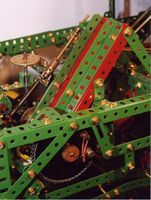 The locomotive is quite attractive and makes use of a range of traditional Meccano parts but also has many special custom-made plastic parts including the wheels. 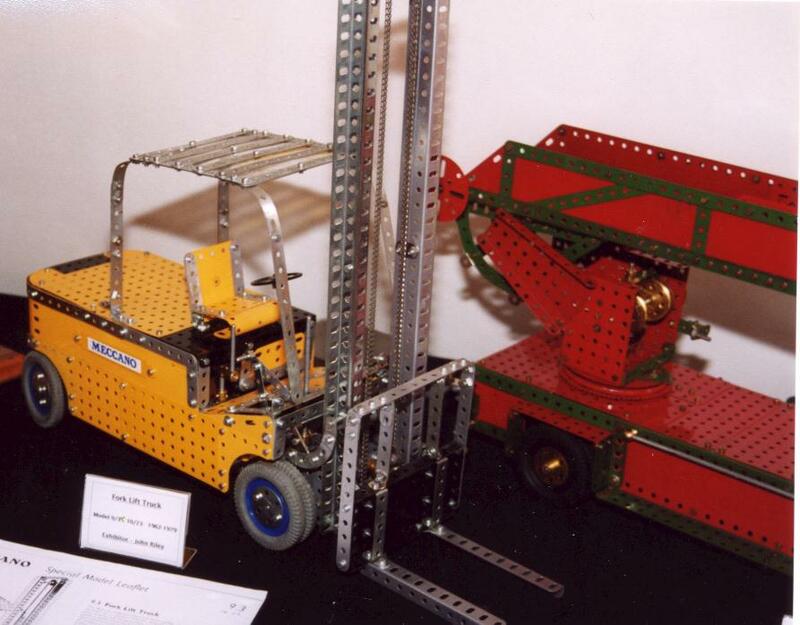 By the way, the stand on which Roger had mounted the model is not included in the set - pity about that. * Fire Engine from the same source. 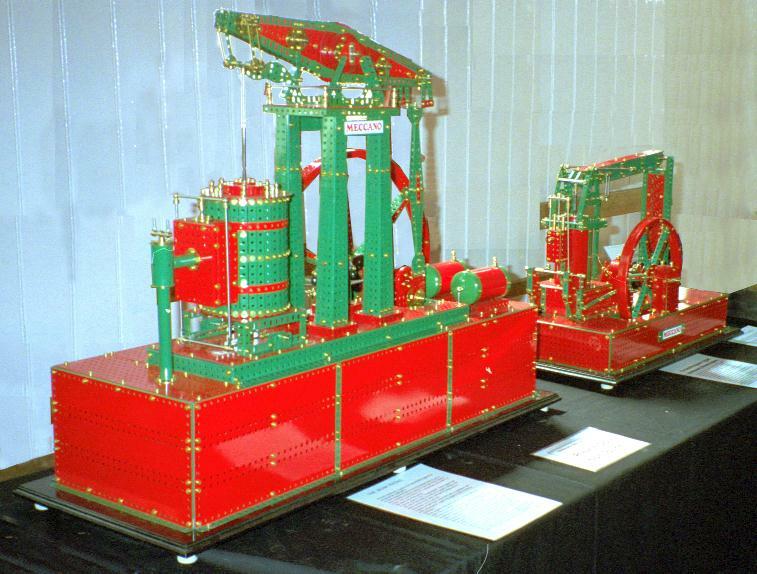 Both were constructed in beautifully restored red-green parts. * Merry-go-round which is an attractive free lance model. egg beater which looked as if it would work very well in the kitchen. 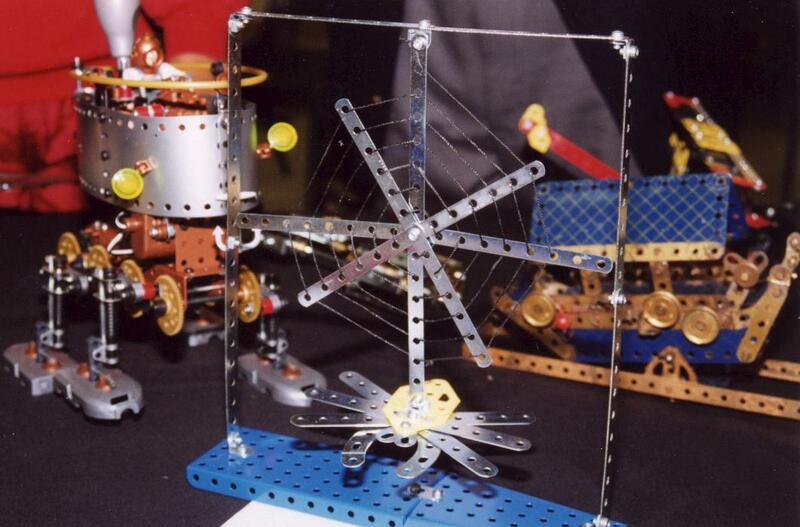 At right is her Meccano website (and spider). Further down the table Bill Inglis displayed two models both made from the 9550 Motions System Manual. 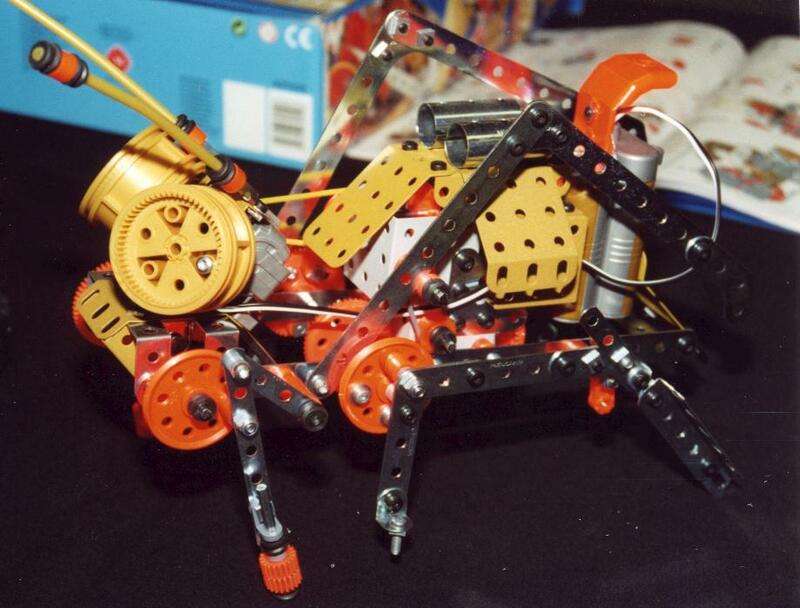 * Bug (animated and motorised) shown on page 30 of the manual. * Council sized Ride-on Mower (motorised) shown on page 57. That's all a bit different from the huge one-man exhibitions you used to put on in the Eastern Suburbs in the 1960's and 70's Bill! At the end of the table Chris Comer had set up two models. * Crane from the Centenary Set very neatly done. * Motor Coach from the 1970 blue-yellow No 6 manual, nicely fitted out with all internal seating. * Mobile Workshop from the No 10 manual of 1937 again using mostly Jackano parts. 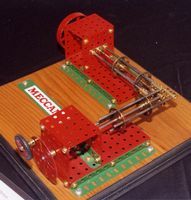 This was a motorised model with a belt operated mechanism that powered various workshop tools replicated in the model. These included a bench lathe, forge, grindstone machine, radial drilling machine, air compressor and crane. The hinged sides in the No 10 model were omitted to provide better visibility of the inside works. * The Titanic. The design of this freelance model was based on blueprints, photos and drawings of the ship. These are contained in a book by James Cameron that was released at the same time as the film Titanic. 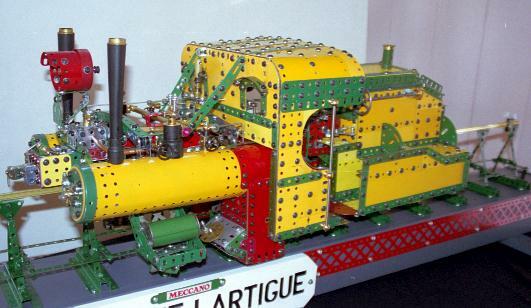 * Showman's Traction Engine (in blue/yellow/zinc) built from an illustration on the cover of the Meccano Magazine, Dec. 1970. 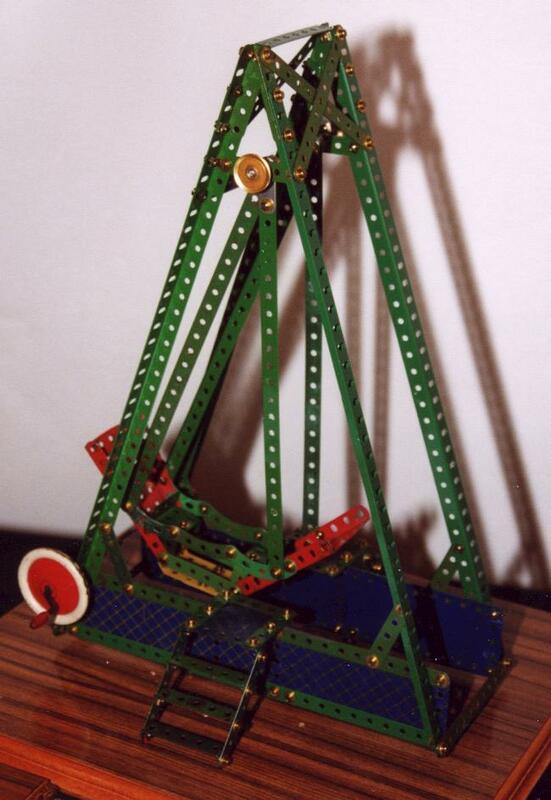 The original was designed and built by Mr H J Halliday and won the Meccano Cup at the 1970 Model Engineers Exhibition. 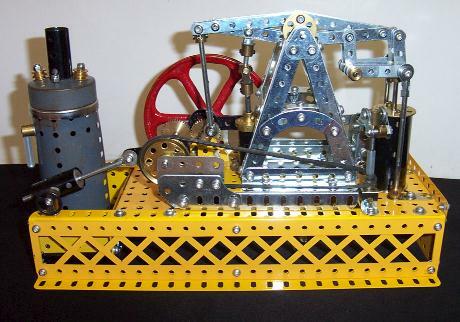 * Meccano Single-Cylinder Horizontal Steam Engine in blue/yellow/zinc - SML No 11. * Benetton Grand Prix Racing Car in red/green based on the 1996 Benetton car using photographs and diagrams from the Melbourne F1 Grand Prix Official Programme. * Swiveling Jib Crane in blue/gold from the No 3 manual of 1937. * Robot in red/green from the No 8 manual of the early 1950's. * 3-Wheeled Sports Car in blue/gold from the No 4 manual of 1950, with various modifications. * 3 Wheel Delivery Van in red/green from the No 4 manual of 1950. 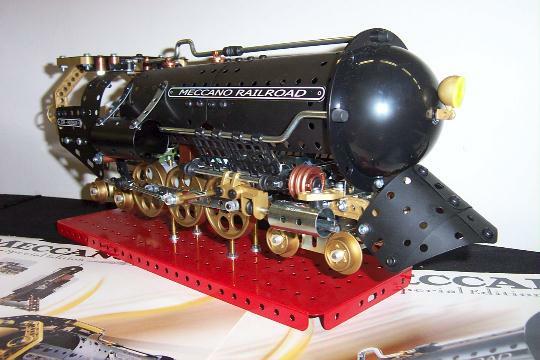 * A Meccano Railway in nickel with clockwork engine running on 3 rail electric O gauge track! 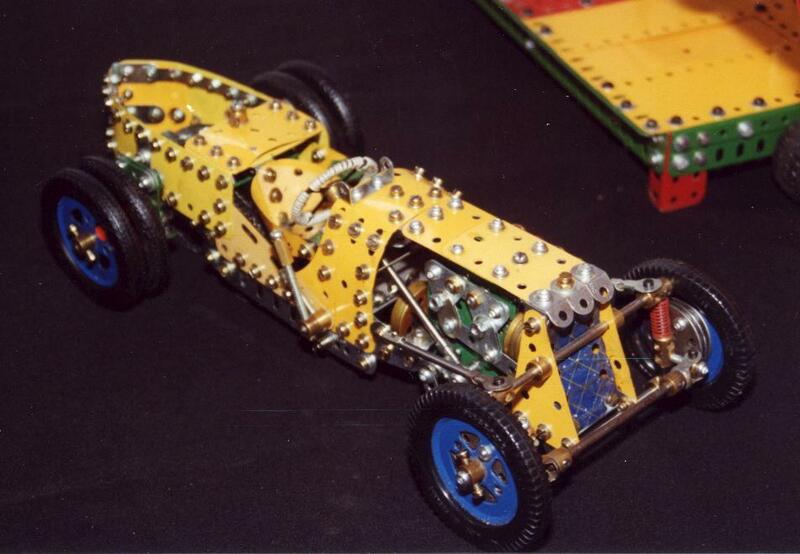 A very attractive layout complete with matching accessories in Meccano. 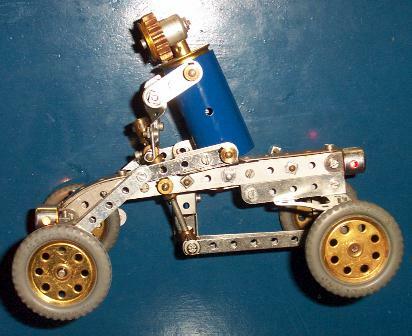 * Meccano Tractor, Gun and Gun Carriage in nickel from the No 6 manual of 1916. 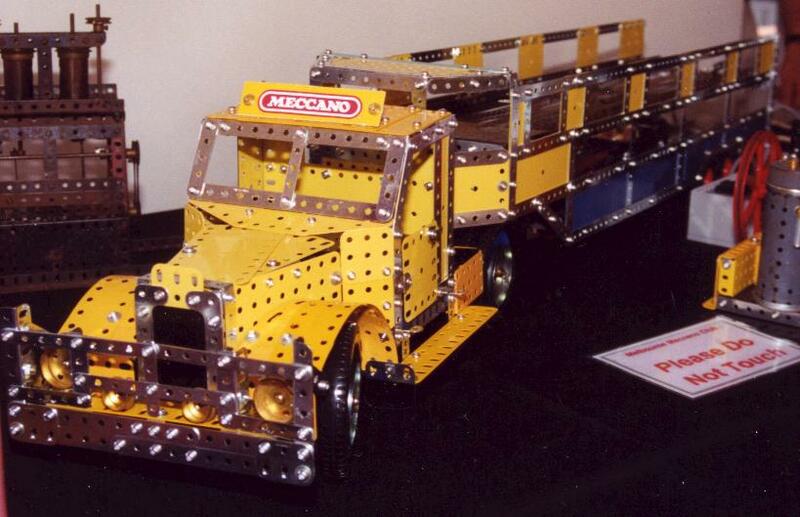 * Ambulance - a No 2 Dinky Builder model. * Ezy-Bilt No 3 Set from 1944-45. 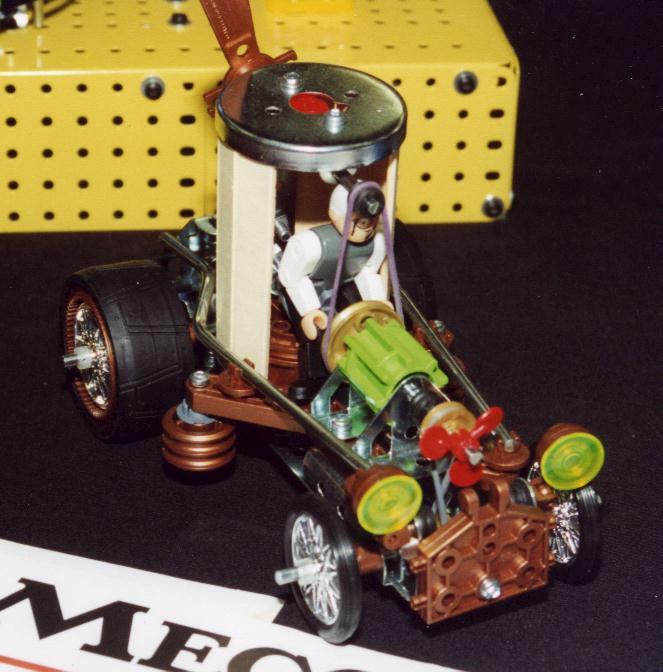 * Meccano Outfit No 3 from the early 1950's. 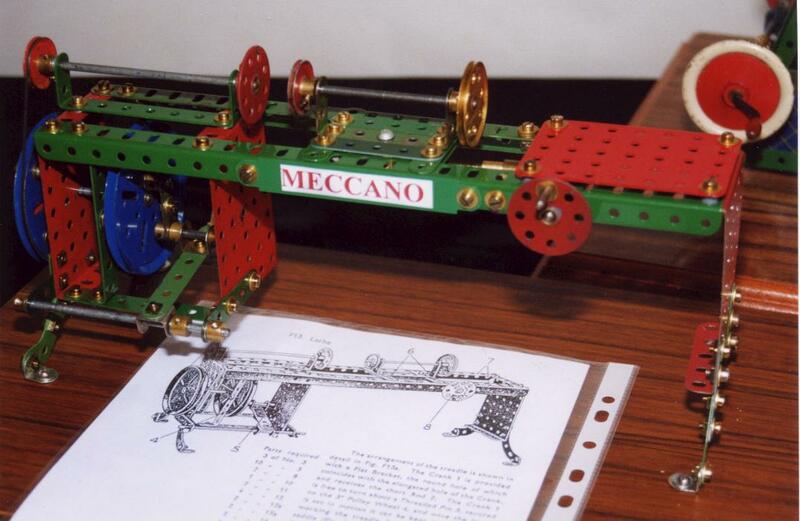 Finally he had two examples of the Meccano Geared Roller Bearing. 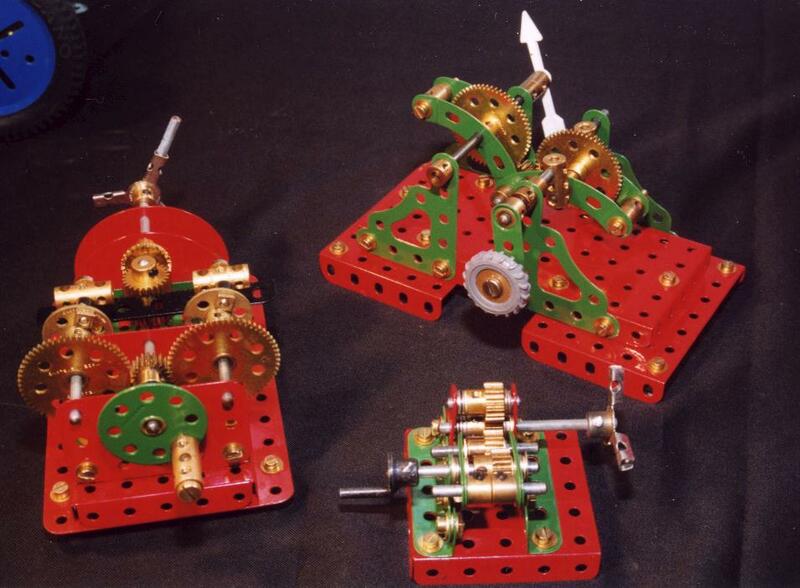 One was an original in nickel and grey from 1928 in its original box and the other an excellent reproduction in red/green from MW Models in a high quality Tony Press replica box. 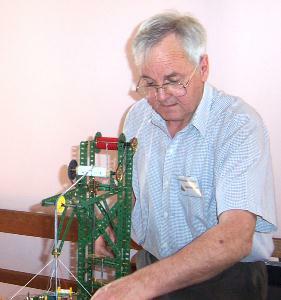 Jim Osborne was demonstrating two novelty models. * Rotating and Revolving Circles described in Constructor Quarterly No 40, June 1998. 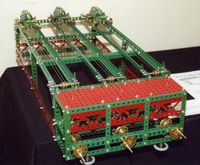 This model was designed by Stephen Miles who described it as follows. "This is not a model of anything useful, unless it is useful to make people smile. It makes visitors stop with an expression first of puzzlement and then of pleasure." I'm sure everyone who saw it will agree with that summary! 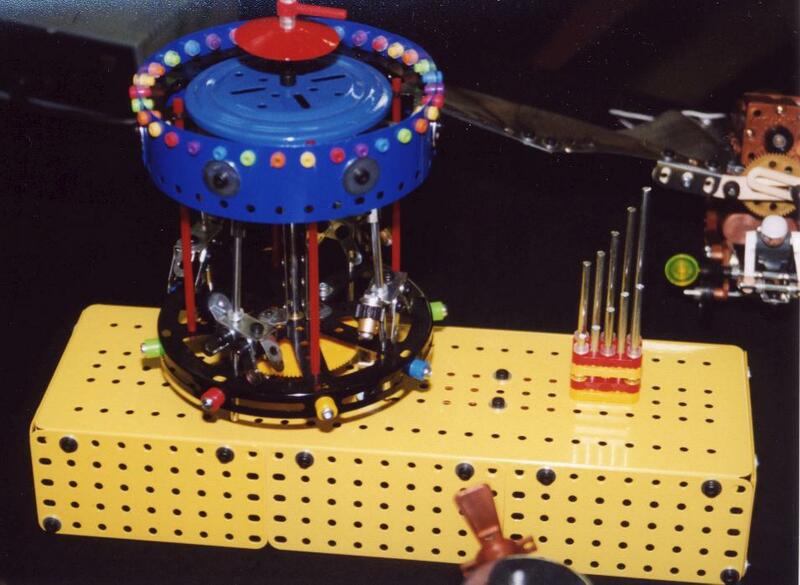 * A Dealer's demonstration model that had been re-designed by Jim. 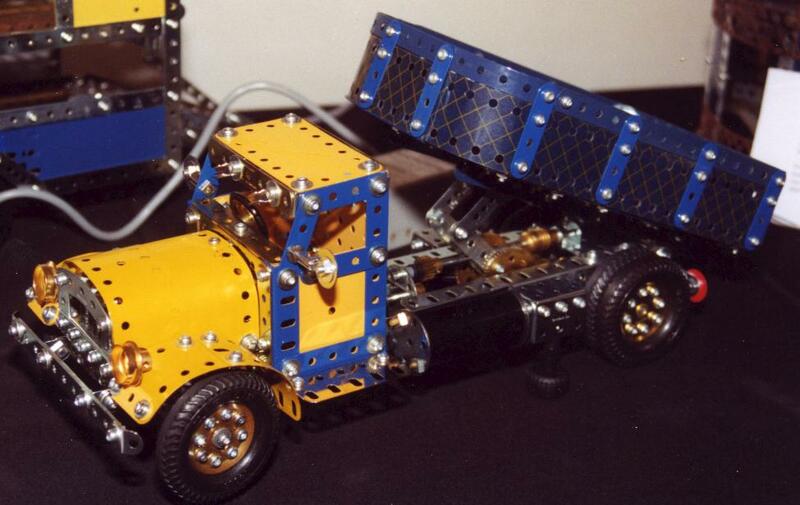 It looks like some kind of hand-powered car - look at the photo below! 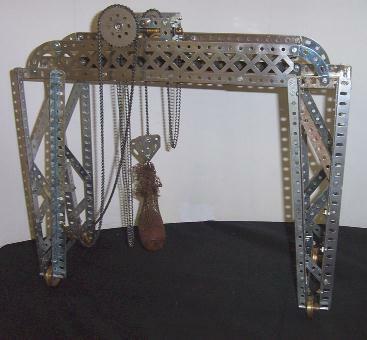 * Meccano Gantry Crane in nickel - always a favourite the way it captures the charm of old-style Meccano. 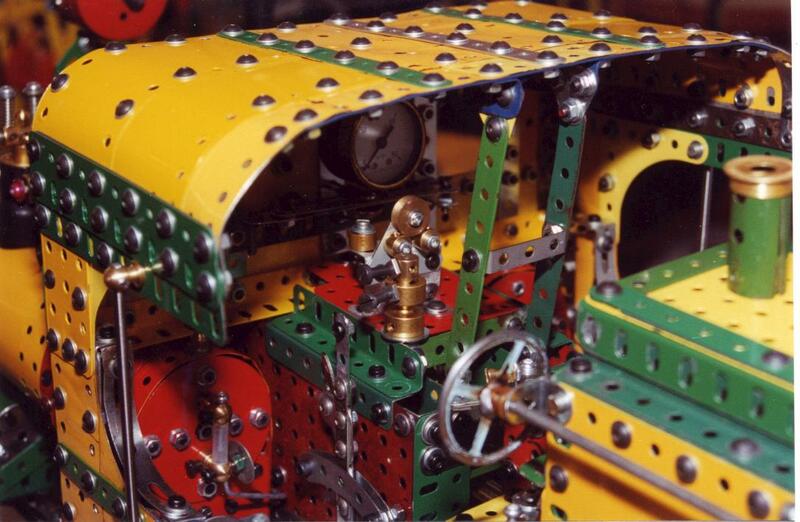 * Steam Lorry (in unconventional colours!) from the No 2 manual of 1938. * Seaplane in zinc and yellow from the No 5 manual, early 1950's. * 3-Wheeled Sports Car - like Tony's but without the refinements. 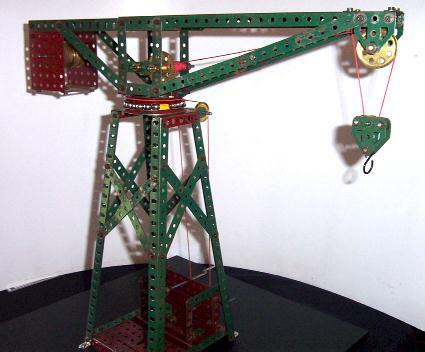 * Dockside Crane in red/green from the No 6 manual of 1958. 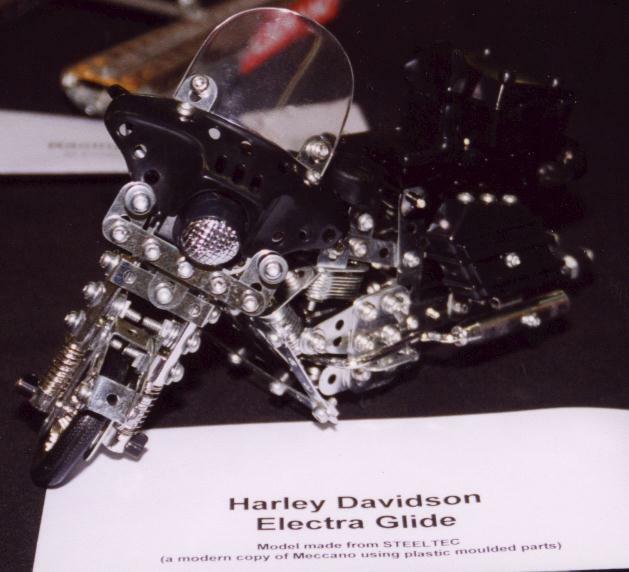 * Harley Davidson Motorcycle in Steel Tek (who said that?! ), but which does look rather nice. Malcolm Booker visited us from Sydney and brought with him several models ranging from the rather small to the rather large. Thank you very much Malcolm for going to so much trouble. Your display was a major and welcome contribution to our exhibition. 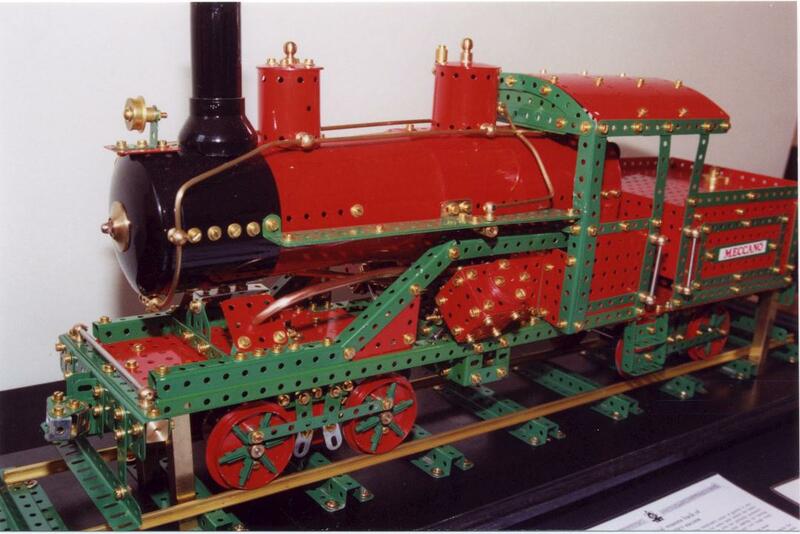 * Sterling Single 4-2-2 Locomotive built from repainted red, green and black parts, 1.73 m long. 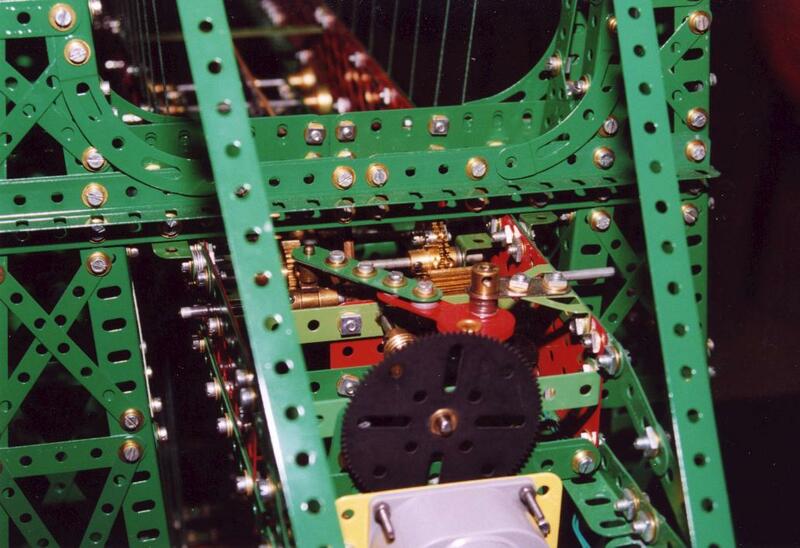 The driving wheels are part no 167b with special annuli. 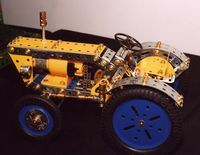 It is powered by two mk1 MO motors connected in series, one in the engine and one in the tender - all wheels turn. 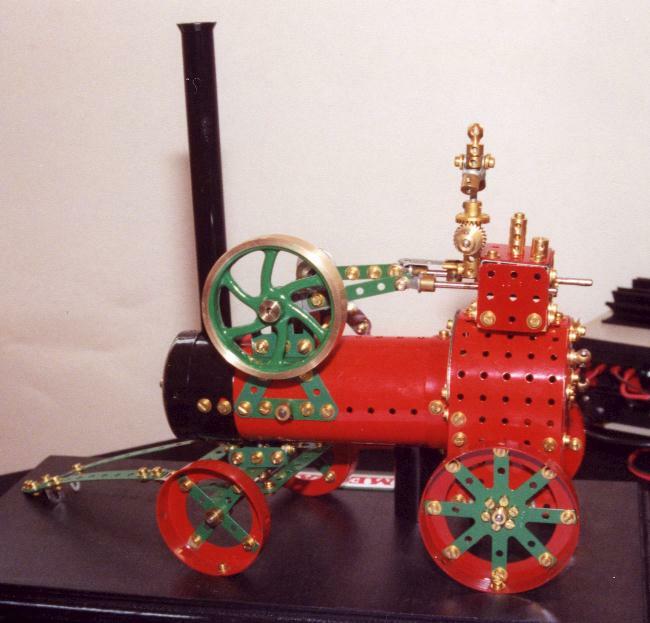 * Southern M7 0-4-4 T Locomotive built from repainted red, green and black parts, 1.07 m long. 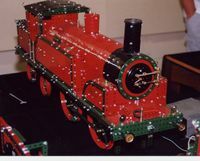 It is powered by a mk1 MO motor and the smoke box door can be opened. 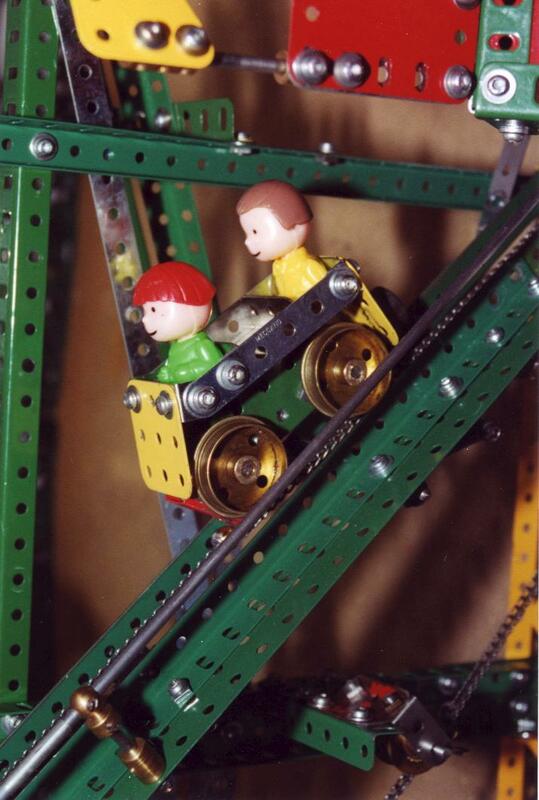 Both locomotives are supported so that all wheels are just off the table so that the wheels can be turned with the model stationary. * Electric Clock built from repainted red and green parts, powered by a 240 V synchronous motor. 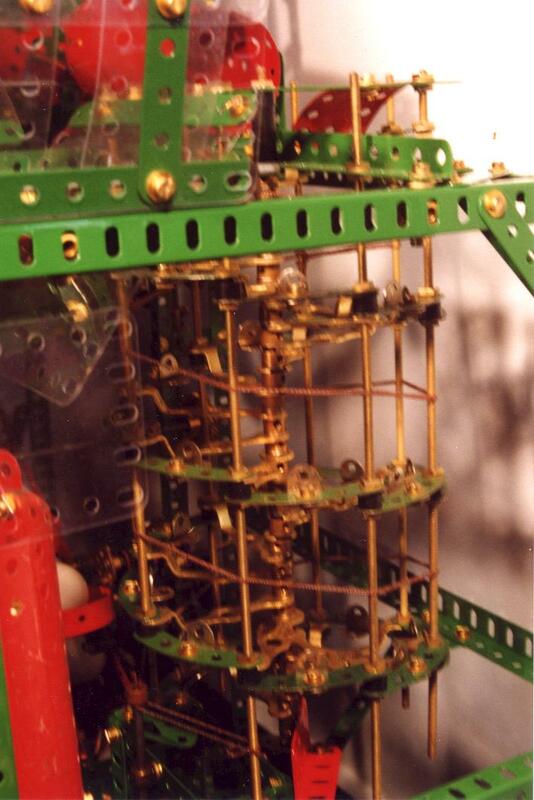 The face is from a No 2 clock kit and the seconds hand is a Meccano pointer. * Voiture de Ma�tre is an old-style car designed by (the late) Dr Keith Cameron which was described in the first issue of Constructor Quarterly. 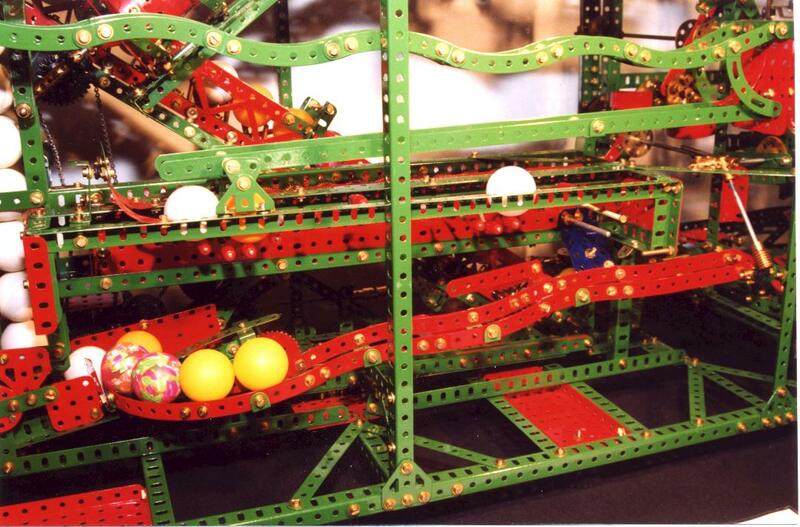 It is built from repainted red and green parts and blue plastic flexible plates and is powered by a No 1 clockwork motor from 1965. *Voiture de Ma�tre is an old-style car designed by (the late) Dr Keith Cameron which was described in the first issue of Constructor Quarterly. It is built from repainted red and green parts and blue plastic flexible plates and is powered by a No 1 clockwork motor from 1965. * Truck from 1916 built from nickel parts with black artillery wheels and powered by a Nickel No 1 clockwork motor. 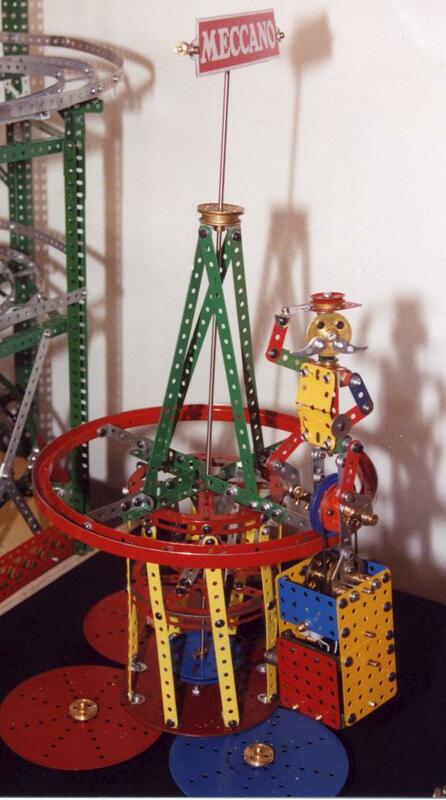 * Robot powered by a magic motor built from 1950's red and green parts and designed by Tony Parmee. Sadly, this model had suffered a little during its journey and was not walking as well as it might. 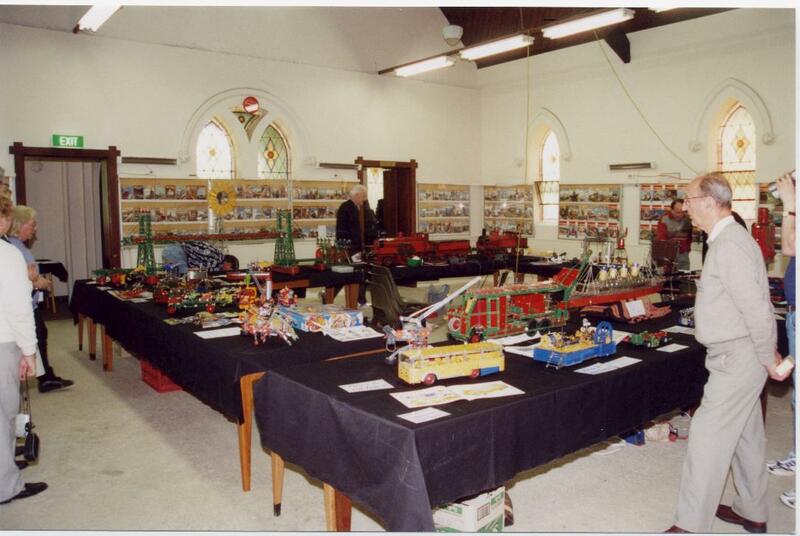 The display in the Main Hall was very impressive but more than one visitor was surprised to learn that there were even more models in another hall. 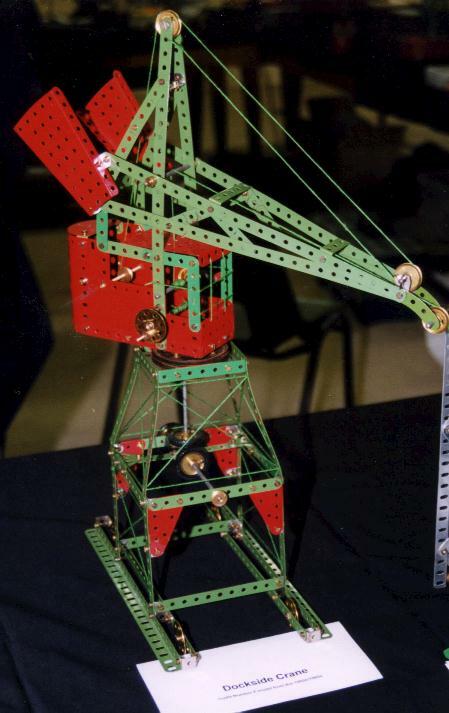 On entering the Alfred Neufeld Hall, the first model on display was Bill Davis's Girder Crane from the No 4 set of the late 1920's (manual model No 407). This was nicely finished using parts from the period. 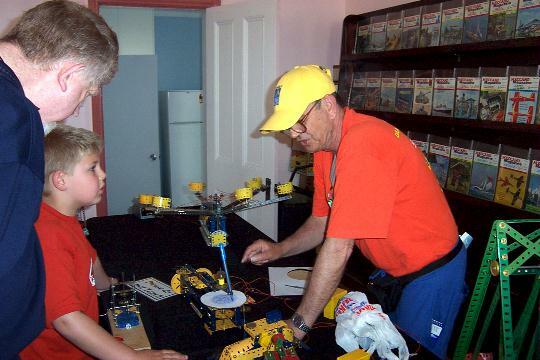 Around to the left of the entrance, Mike Maloney had an impressive array of models, mostly in yellow and zinc. 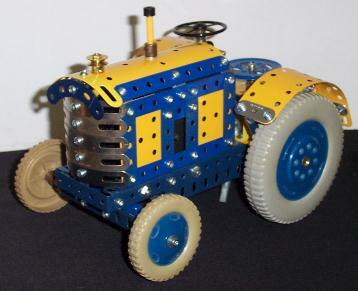 *Farm Tractor - based on a Meccano Magazine model of about 1962, using the 'new style' exploded view instructions. 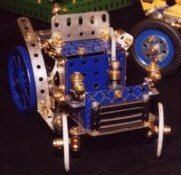 It featured the 41/4" Road Wheels and was driven by a No1 Clockwork Motor. 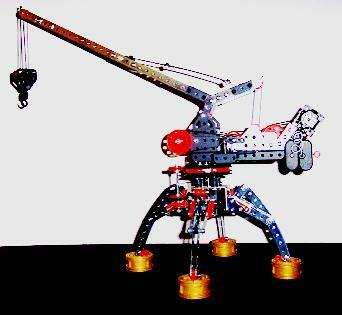 *Hammerhead Crane - based on model No. 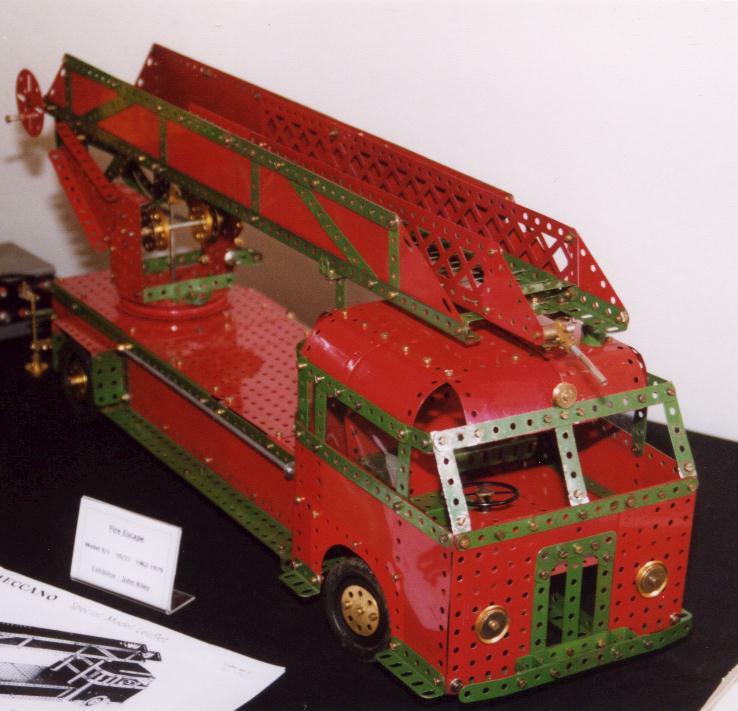 105 - 107 in a Marklin Manual from about 1954 (about equivalent to Meccano Outfit 10). 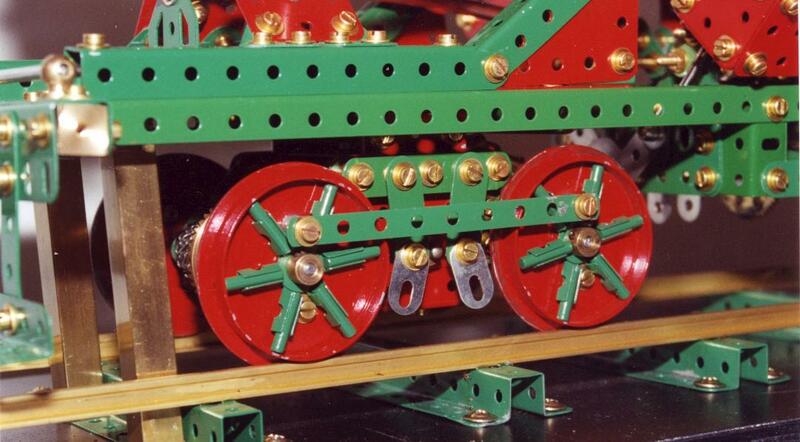 These Marklin model plans were in detailed diagram form, predating that 'new style' used by Meccano from 1962. 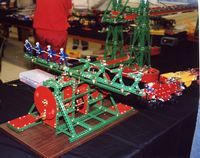 The model was built using Meccano parts apart from 2 Marklin Large Rings (circular girders) and Railings (braced girders). All movements were hand operated. 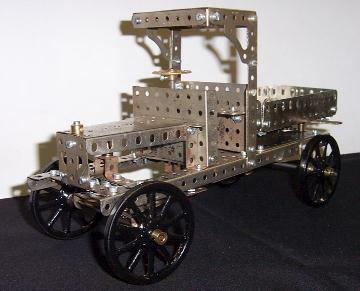 *Car Transporter (Semi-trailer) - based on model No. 105 - 109 from the same Marklin Manual again predominantly Meccano with some old Marklin parts from late 1920's/early 1930's. 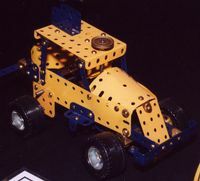 The model used 11/2" WRI tyres for the trailer. The instructions allowed for no motor or gearbox, a pretty elementary steering via chain and sprocket, and a differential, although the Outfit 105 parts list appeared to have sufficient gears for all of these mechanisms. 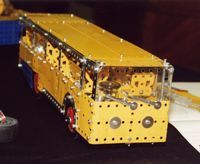 *Tipping Lorry - from Bernard Perier's fine model and described in Constructor Quarterly as Emerald, Sapphire and Gold, though Mike's is "Silver, Sapphire and Golden Yellow!" Construction was both challenging and rewarding and included a compact speed reduction for the MO motor (requiring a couple of Dave Doddrell's narrow pinions to fit it in! 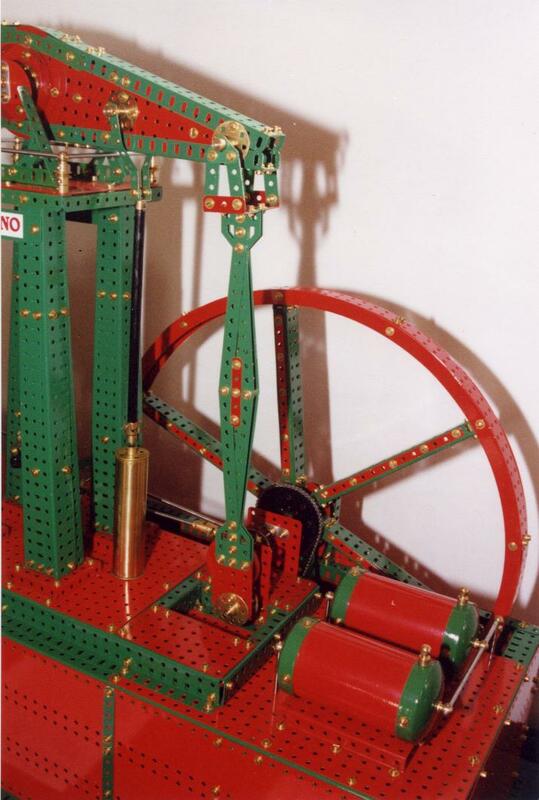 ), a 'folded knee' lever mechanism for tipping, and realistic bodywork set off by the 11/2" Marklin tyres, which have a much thicker profile than the Meccano tyres. 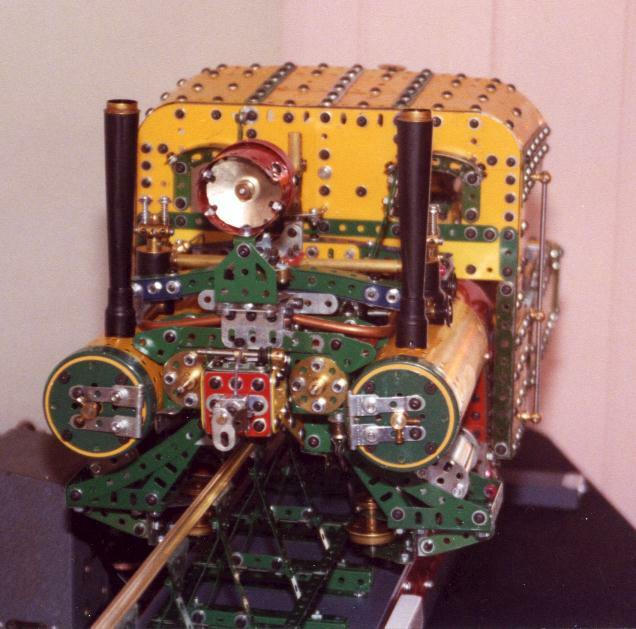 The cabin could be lifted off to show the steering gear and motor drive, and this attracted some interest. 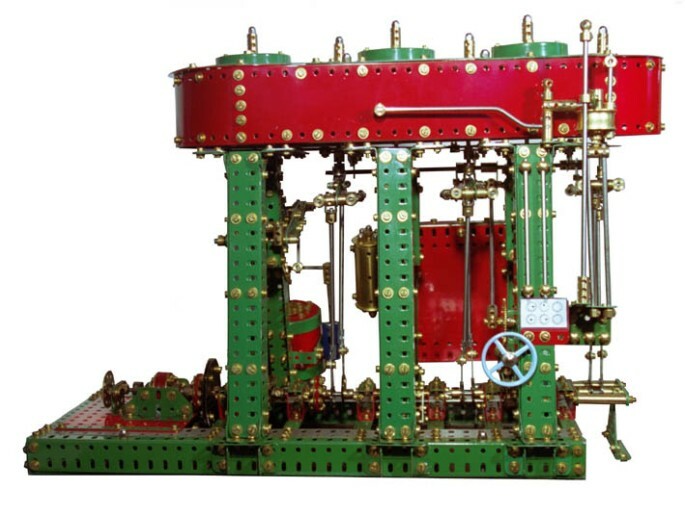 *Beam Engine - a miniature compared to the others in the hall. The model was based on a plan by Mike Cotterill and published in the NMMG Meccanoman's Newsmag. The engine ran sweetly throughout the two days, again driven by an MO motor. 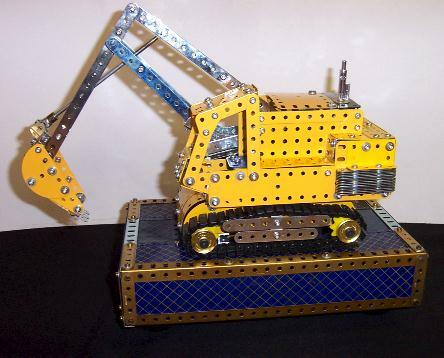 *Excavator - a plinth mounted model of a trench-digger type of tracked excavator, with a realistic digging motion. Slewing and track movements were non-operational, to the disgust of one youngster who (according to his father) was fascinated only by 'Caterpillar' tracks. 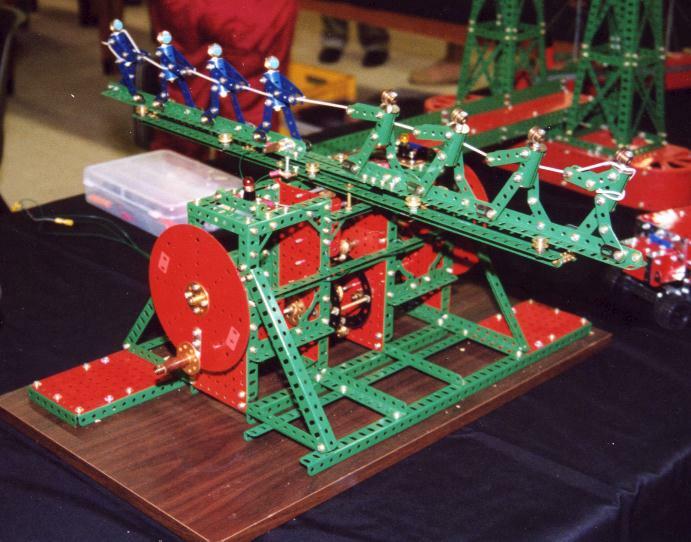 The design called for a twin drive by sprocket and chain to a crank formed between 3" sprocket wheels, to provide a form of quick-return motion actuating the jib and bucket arms. Despite problems with the near-vertical chain drive/s getting out of synchronism the model ran pretty reliably throughout the days. The model was designed by (the late) Geoff Coles and construction was based on sketches and description published by the NMMG in Newsmag 25. 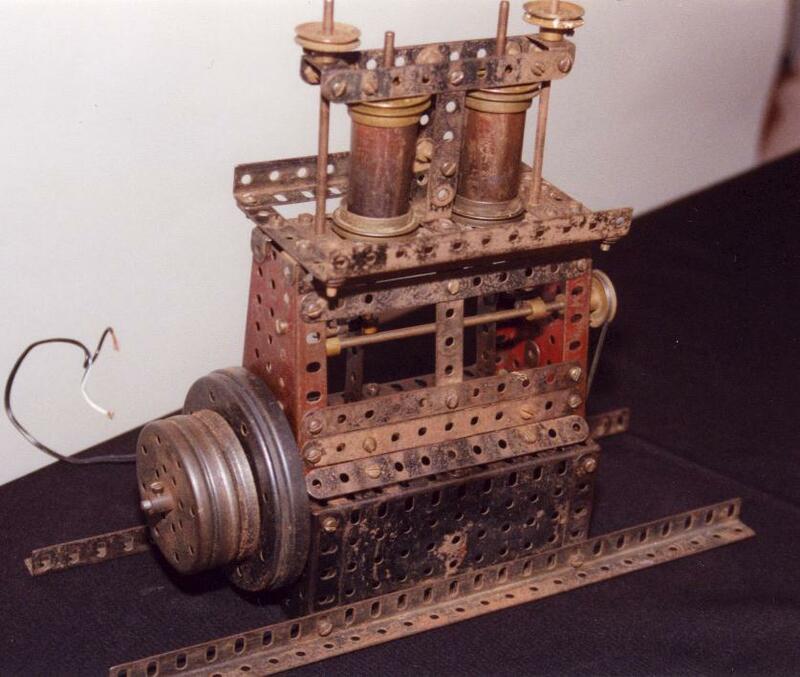 *Zweizylinder-Dieselmotor (Twin-cylinder Diesel Engine to Anglophones!) 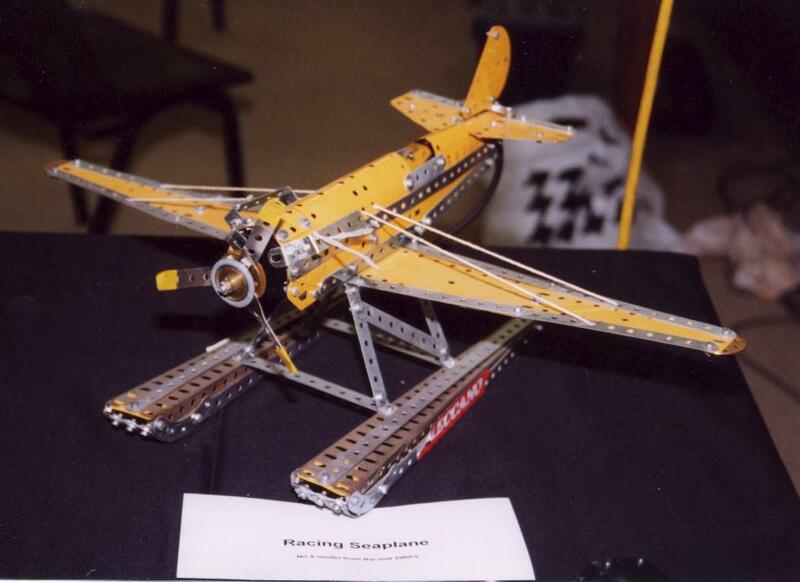 constructed with old Marklin parts. This was a from a Set 3 Manual of 1931. 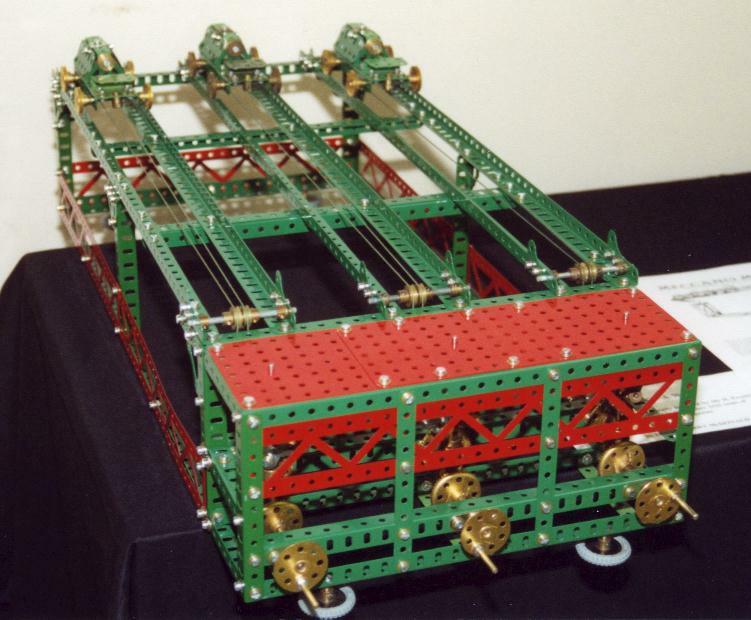 Pretty basic, of course, with the limited variety of parts in the set (strips, girders, pulleys and flanged plates - and lots of angle brackets). 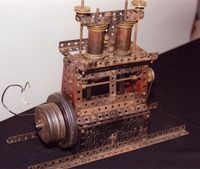 The crankshaft was built up from angle brackets bolted to collars, driving vertical piston rods; the valve rods were actuated by angle brackets mounted on collars striking the face of 3/4" pinions. Despite the condition of the old parts, the model gave a very satisfying 'clatter' when running under power by (another!) MO motor - just about drowning out Peter During's Octopus, but not quite!! 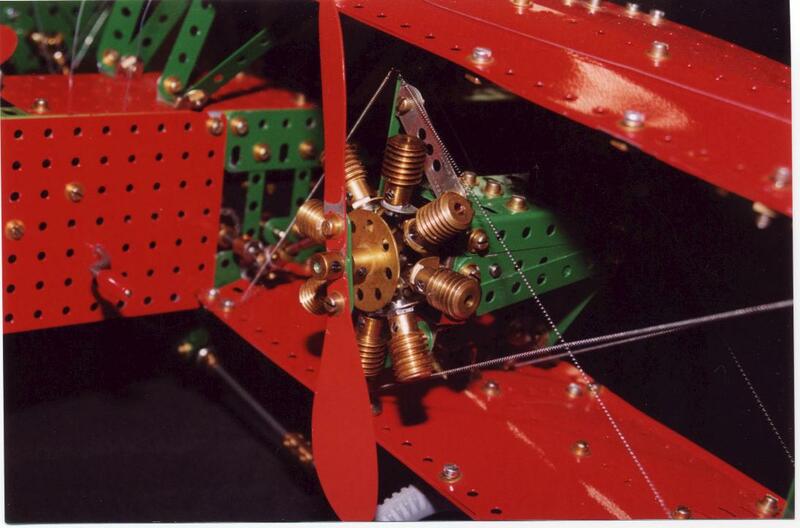 Mike says, "I find it's fun to build some of these old models, and re-live the frustration modellers must have had with the long bolts in close spaces! 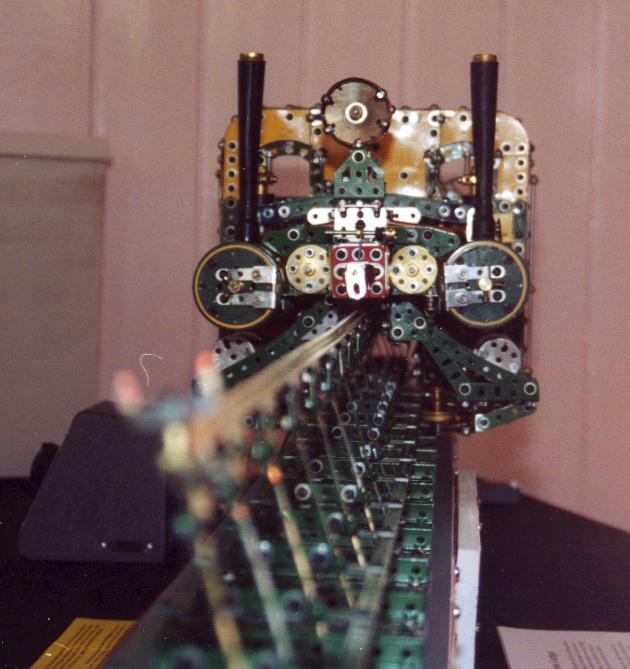 Interesting too, to note the changes in some parts over the years - different lengths of double brackets and double angle strips, widths of pulleys, double tapping of bosses, etc. And now we have plastic and tri-axles and no bosses. Such is progress!" Next, Peter During was busy demonstrating his Octopus Ride and Meccanograph. 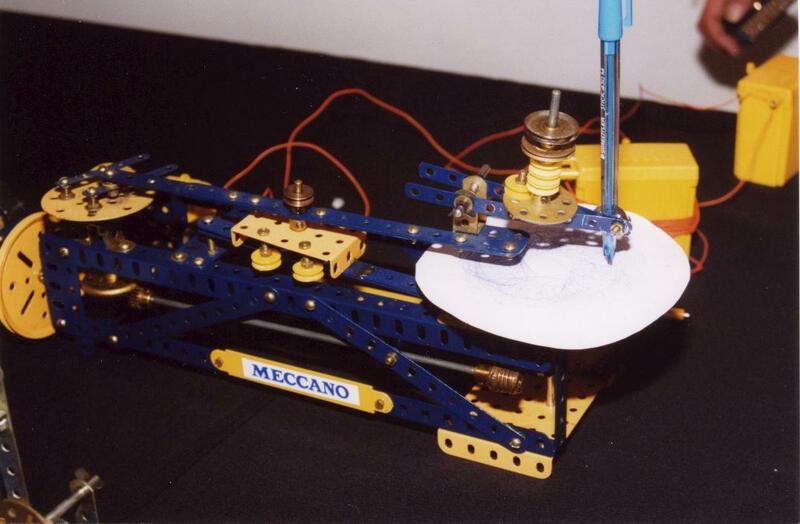 The former was working well but the Meccanograph seemed to need some attention from time to time. This was not a bad thing - the visitors were clearly interested in observing the adjustment process! *Fire Engine: No. 9.3 (later No. 10.21) in red/green. *Forklift: No. 9.3 (later No. 10.23) in yellow/zinc. 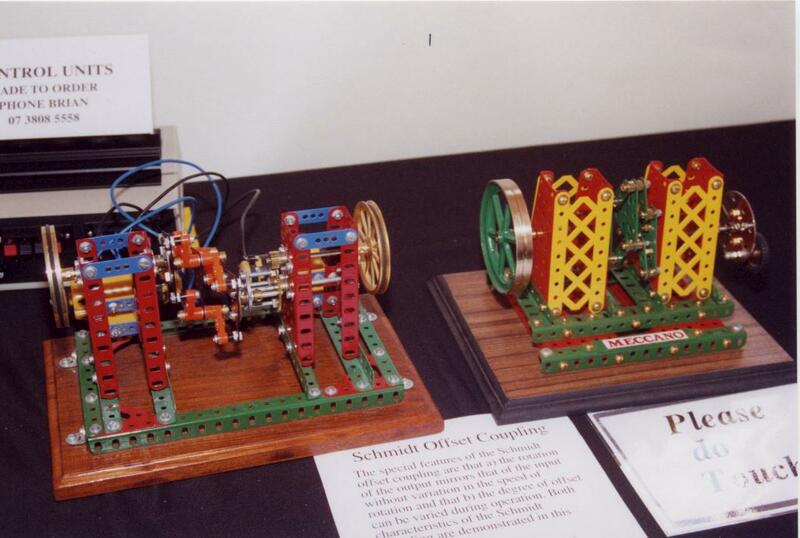 These were two very nice models with lots of interesting mechanisms, but I didn't catch John giving any demonstrations - pity about that. 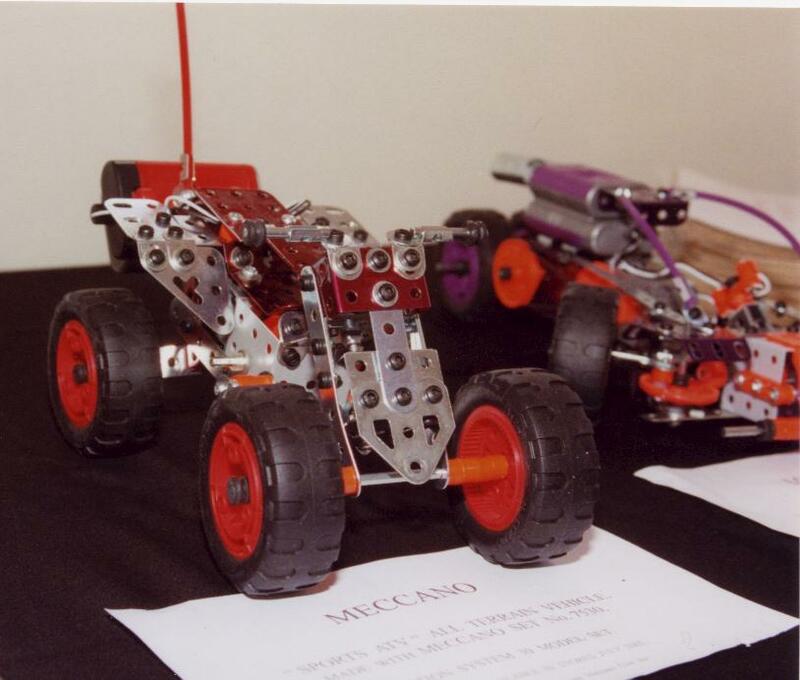 Moving along the table, Steve Hatton showed a display of Meccano motors. 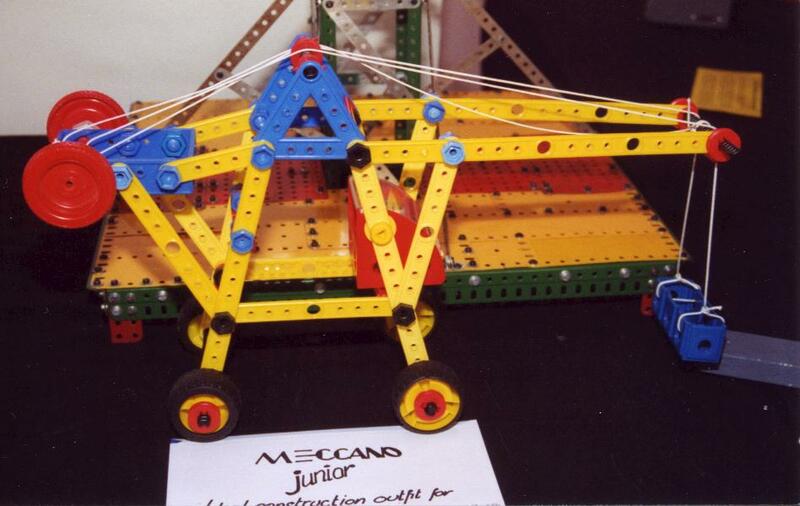 its Meccano France box although made in Japan. *No 1 Clockwork Motor: early 1950's, black crackle, in original box. 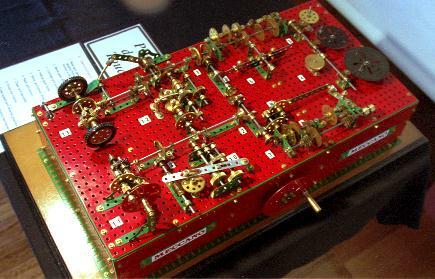 *No 2 Clockwork Motor: 1930's, dark blue, in original box - a very nice example. *E15R Electric Motor: early 1960s black crackle finish. *E20R Electric Motor: early 1950's black crackle finish. *EO20 Electric Motor: early 1950's, black with correct nickel pulley. *Emebo Electric Motor from the 1960's. To complete the lineup Steve also had on display the powerdrive and junior powerdrive motors from the 1970's as well as some French motors from the 1980's and 90's. 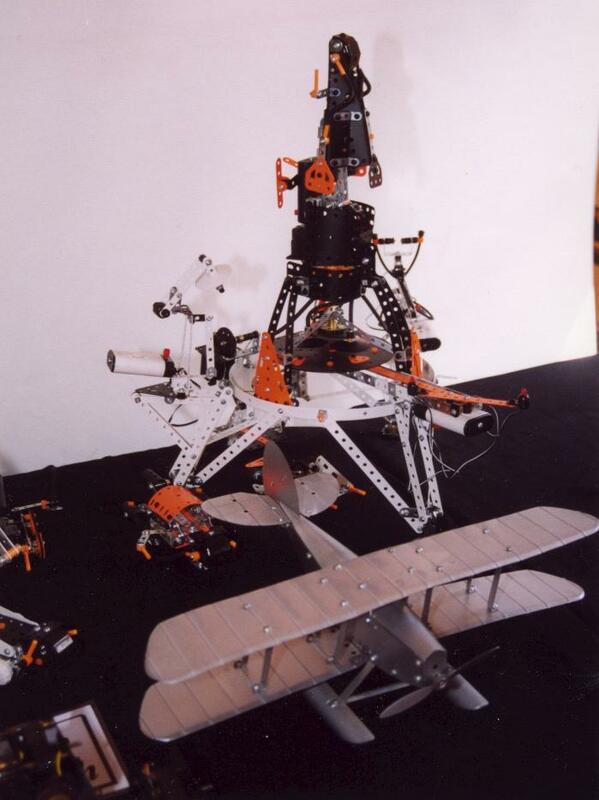 Steve also displayed 5 models from the 1997 "Mission of the Universe" Series. These were: Defender Unit (4810), Meta Cruiser(4820), Detector Unit(4830), Space Explorer(4840) and Space Base (4850). 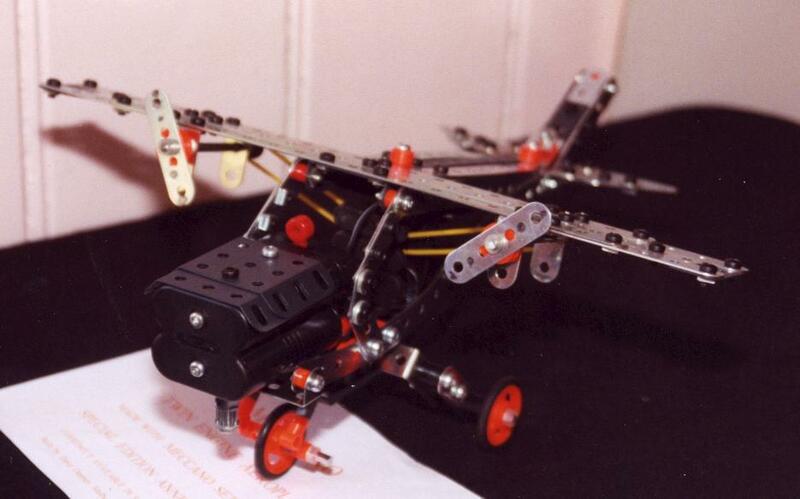 Nigel Jolley's contribution was by far the most modest - a (very) small helicopter. 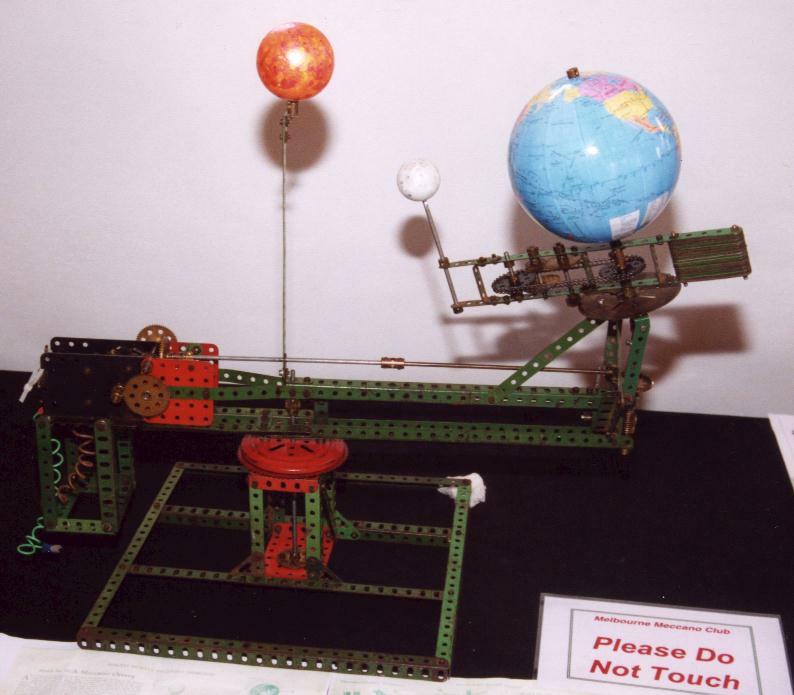 Rupert Alexander had an interesting model of an orrery constructed from a description given in a Meccano Magazine of the 1920's. Next to Rupert Graham Jost had his usual extensive display of models. 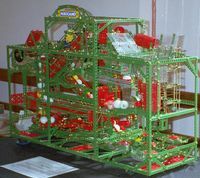 *Braiding Machine - The instructions for this model were featured in the Meccano Magazine in October and November 1966. In Graham's words: "As with many such instructions, they left something to be desired when it came to actually encouraging the model to work! Tim Edwards, of the Meccano Society of Scotland, built an improved version of the model recently, in which he included simplified and more reliable mechanisms for operating the transfer levers which flick the spools from one carrier to the next. He very kindly provided me with many photographs of his machine and much advice which has been most helpful." The braid comprises a central core (of light blue thread here) around which are wound eight separate braiding threads arranged in a three-dimensional "plait" - those familiar with Maypole dancing will recognize the manner in which the braid is built up. The machine produces braided cable at about 9' or 3 m per hour, and uses up thread from each of the eight spools at about 12' or 4 m per hour. 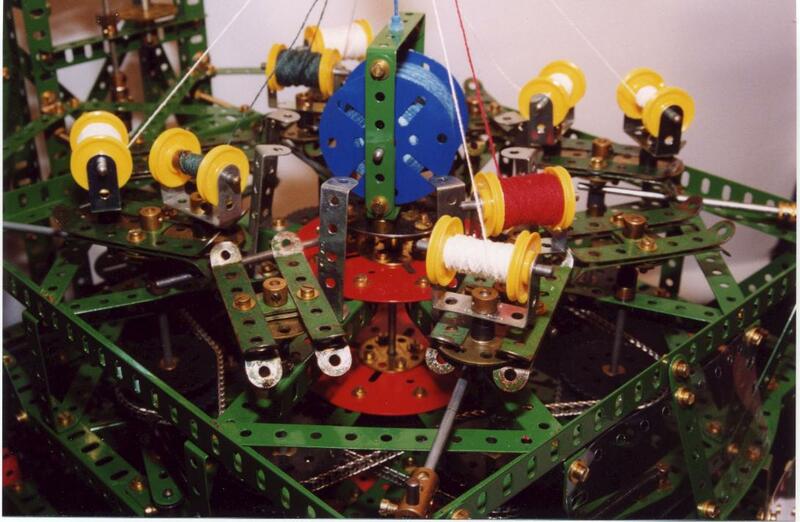 The spools each carry about 100' of thread, which is sufficient to allow continuous running for about 8 hours. 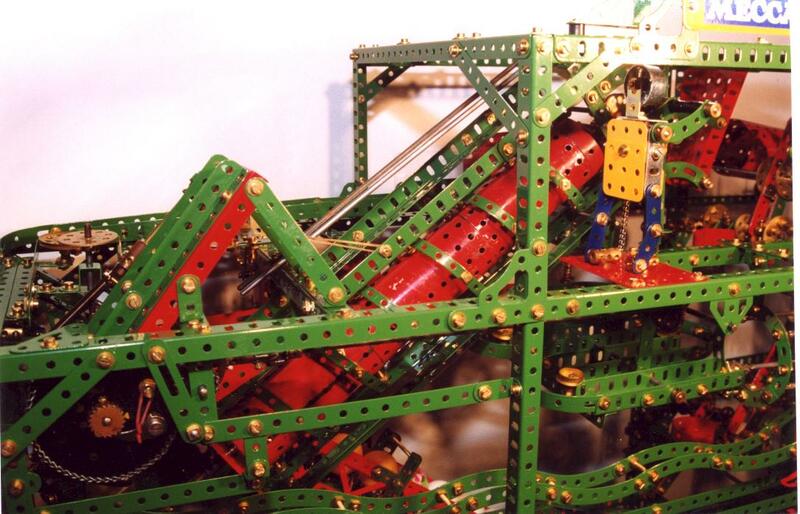 The length of stored core thread is sufficient to outlast several Meccano shows! 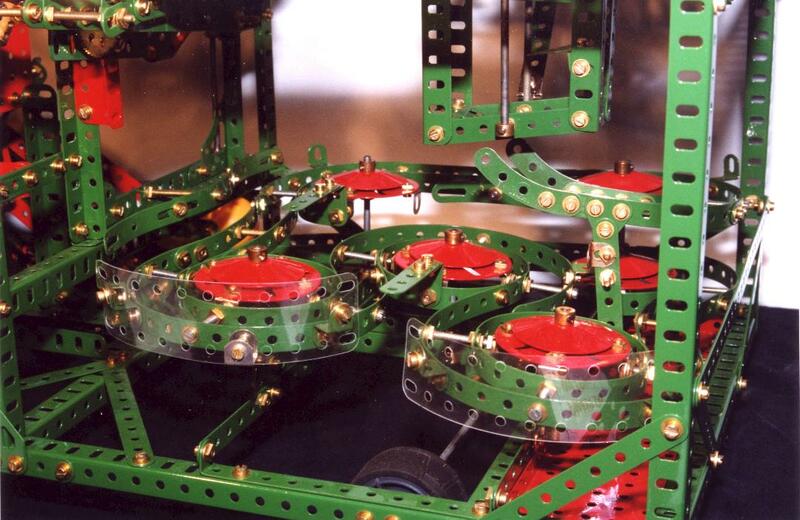 *Ball Roller - based on a design by Dr Alan Partridge described in Constructor Quarterly No. 51 of March 2001. Graham's comments about his model are as follows: "In this version, I have doubled its size, and added several more ball-rolling modules or elements - these are the sometimes tortuous paths through which the balls have to pass before rolling easily along to the next. There are nine modules altogether - see if you can spot them all! 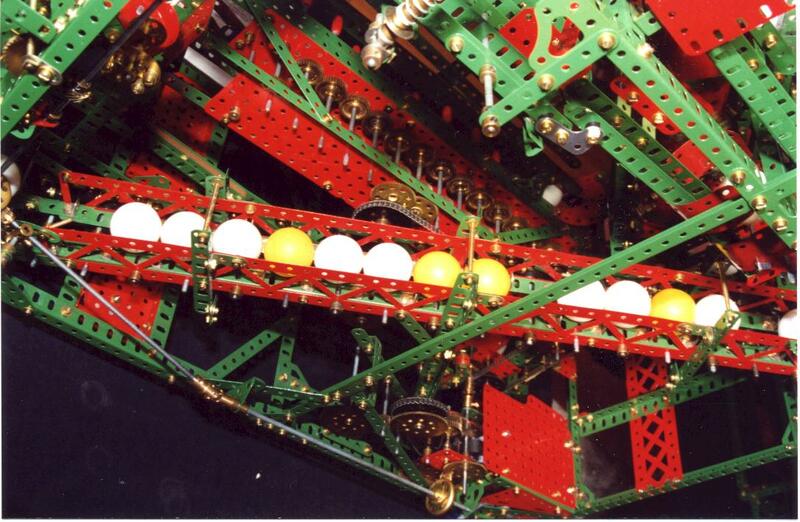 In addition, a ball is fired every 1 1/4 minutes from one side right over the top of the model to be caught in the hopper on the other side - an occasional wayward ball is not unknown! A total of 38 ping-pong balls is in circulation, and the time for an individual ball to make a full circuit is about four minutes. The unit is driven from a single mains motor." Did anyone notice all of that? - I must admit that I didn't. *Penguin Staircase - This model of the famous Penguin Staircase is based on a design by the late Dr Keith Cameron of the USA in the early 1980s. It has proved immensely popular with Meccano builders, and was evidently to be seen at all major Meccano exhibitions for several years. 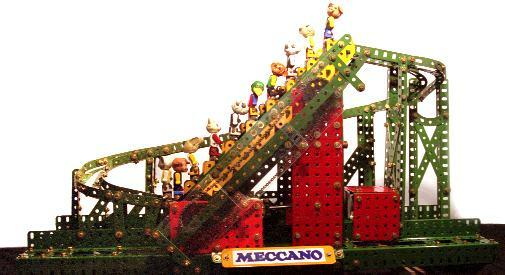 The figures in the original model were cardboard penguins - hence the original name of Penguin Staircase. In this model the penguins have been replaced by small animals from the Lego Fabuland series of the 1980s. Both the staircase mechanism and the reliability of the slide itself proved to be quite troublesome. Even now the animals manage to cascade into each other occasionally, but usually manage to free themselves again! *Pedalling Pete - A freelance model inspired by a Canadian design on the Internet. 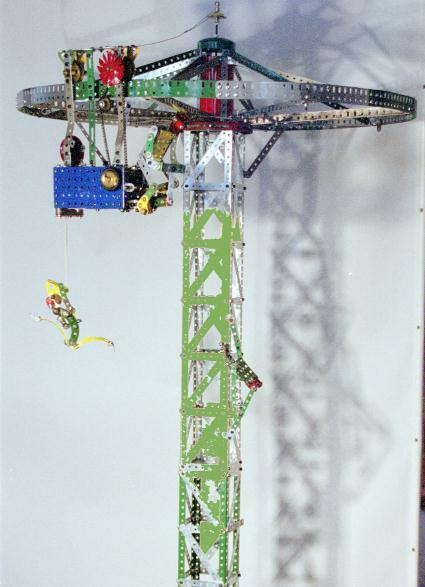 Built in 1950s green and 1970s yellow Meccano and scaled to red-and-black post-war metal Road Wheels. 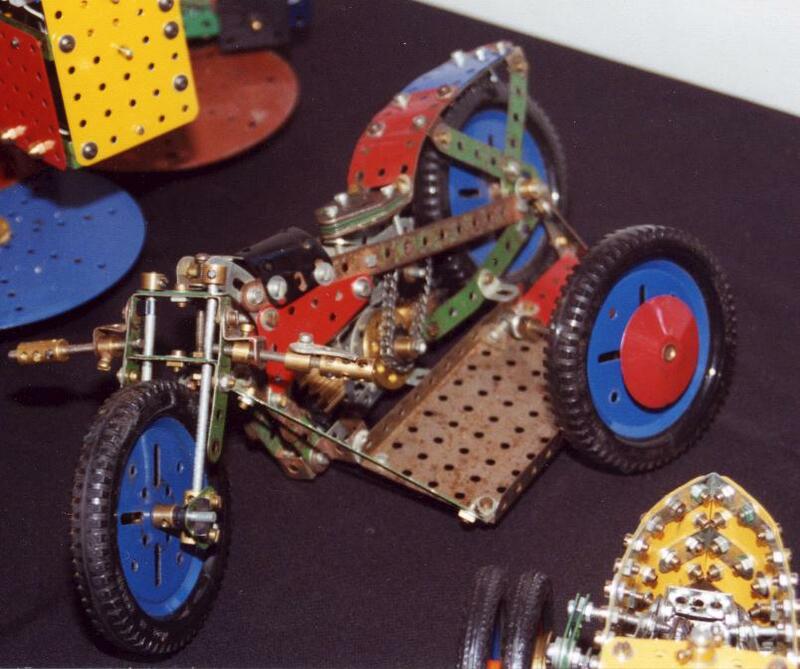 The bicycle wheels are driven via one-inch Pulley and Rubber Ring "rollers" powered by a worm-drive motor in the base. The bicycle wheels rest solely by gravity on these rollers, Pete being stabilised only to prevent his falling over! Since Pete has heard that "slow and steady wins the race", he has decided to adopt this strategy in helping him to try to cycle the whole day through without interruption! Who pedalled away with his feet! But he'll give up at 5, just dead beat!! *Veteran Car - A Canadian design, built in Nickel and pre-war blue plates, using Spoked Wheels and 2" Pulleys, steerable and driven by a Magic Motor. Realistically reminiscent of Great-grandpa's first auto. 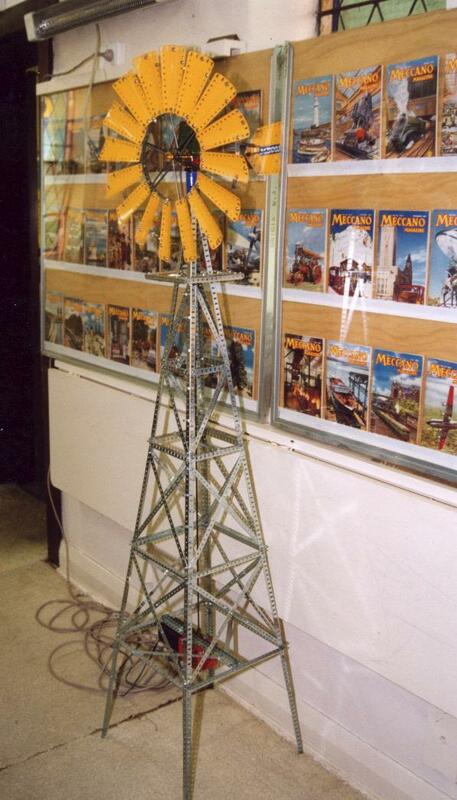 *Windmill - This model graced the entrance to the Exhibition and is immediately recognisable. 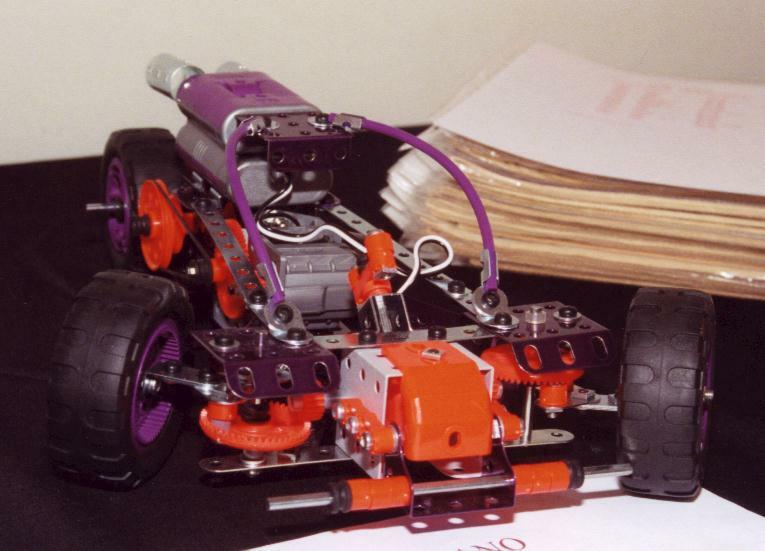 *Hands-on Models - These included an elegant French-designed tractor, hesitating drive, oscillating drive, one-way drive and a tiny racing car utilising Box Spanners for the chassis. 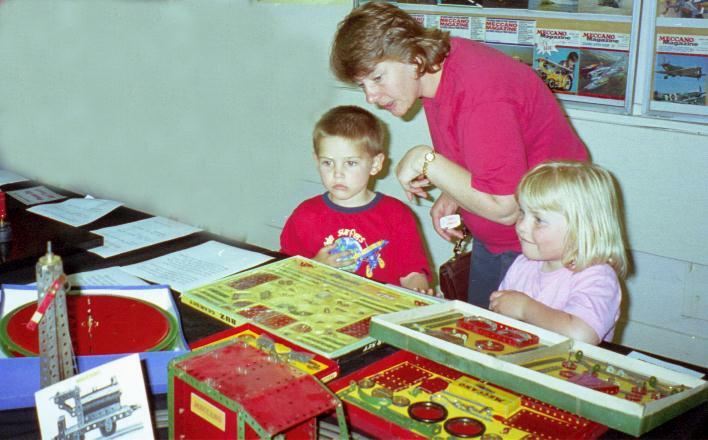 As usual these models were very popular with many of our younger visitors. 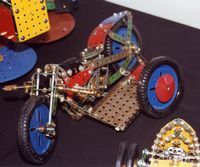 Carol Parsisson exhibited four models from the more recent French Meccano sets. *Robot - Model No 37, Special Edition Set 7080. *Dune Buggy - Model No 11, Dynamic Set 4065. *Racing Car from Set 7064. 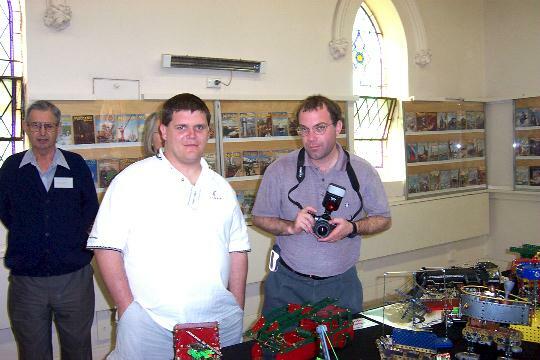 Paul Dale came down from Queensland to exhibit at our exhibition - thank you again for coming Paul. Because he travelled by air his models were by necessity compact, though hardly simple! *His gear box is described by Paul as "a fun model that might better be described as a "box of gears" arranged in a fairly ad-hoc manner. I built it as an exercise to see how many gears I could reasonably place into a small volume and still make it visually appealing. 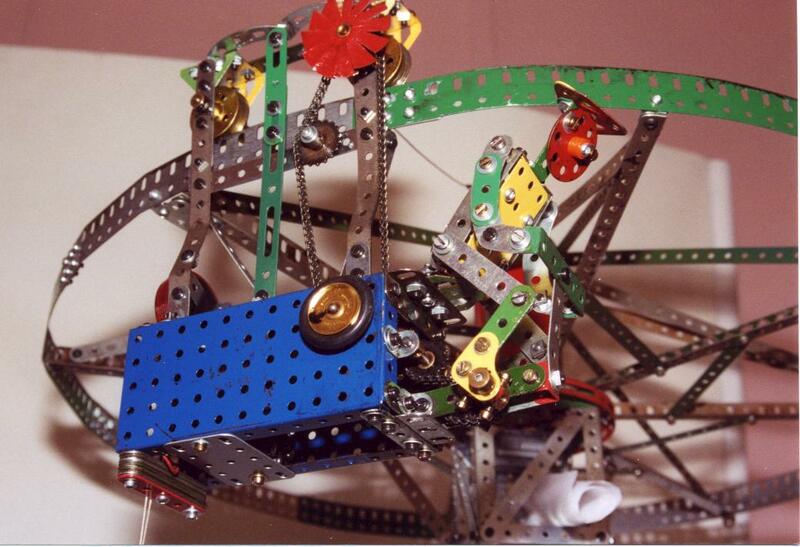 The box consists of a 51/2" cube which contains fifty six gears including all of the Meccano types excepting worms. 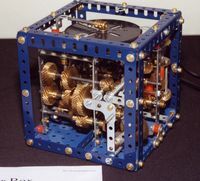 The unit is essentially constructed from two dwell producing mechanisms connected together, to the driving motor and to the "clock" face using a variety of long gear chains." *The Schmidt coupling was powered and demonstrated the continuously variable offset drive capability of this coupling whilst running. 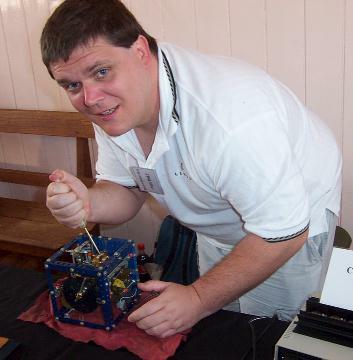 Many members will already know Paul as the organiser of the Spanner email discussion group, a thankless task that Paul performs with remarkable skill and diplomacy. In Paul's words - "it really is a case of admin by disaster." 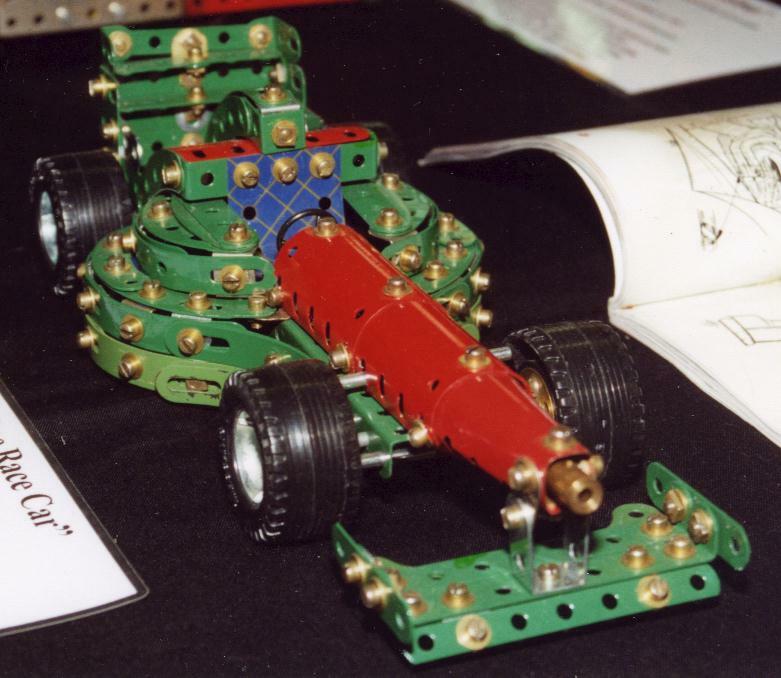 comes from one small Meccano MO motor! 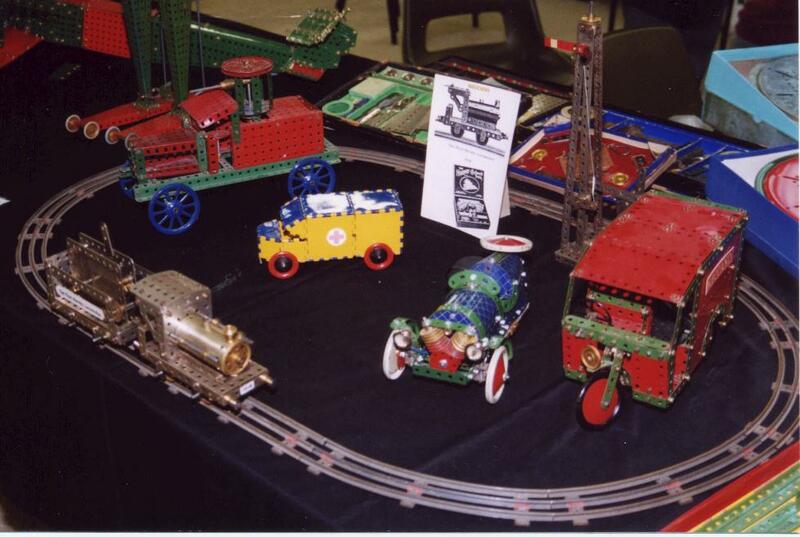 Dave's Display also included several models constructed from some of the more recent French sets. 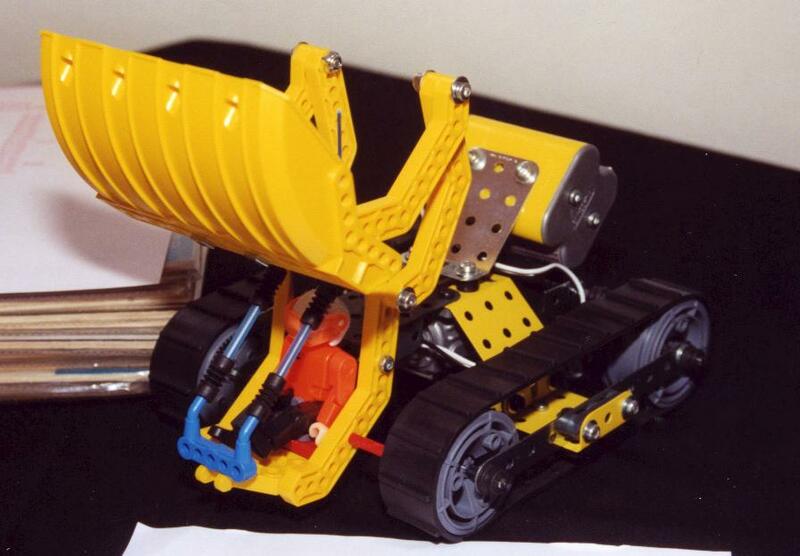 *Heavy Earth Moving Machine - Future Master Series Set No 8600. *Front End Loader - Future Master Series Set No 7600. *All-Terrain Vehicle - Motion System 30 Set. *Special Sports Car - Motion System 40 Set. 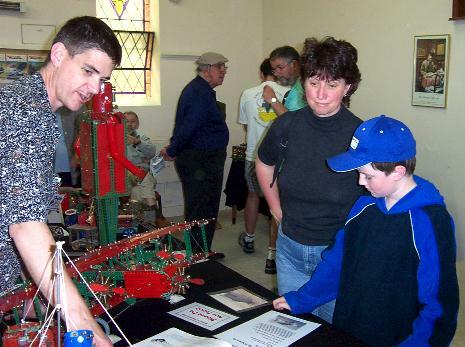 Kimball Monger was demonstrating his representation of the Systeme Lartigue monorail. 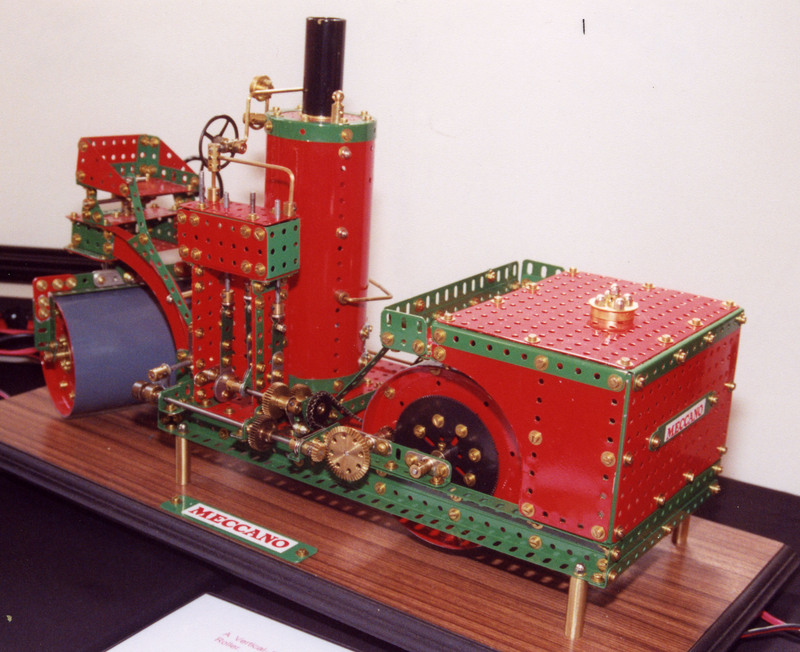 This was a free lance model built to a scale of about 1:10 and is a most attractive exhibition model. It travelled sedately backwards and forwards along it track thoughout the exhibition. 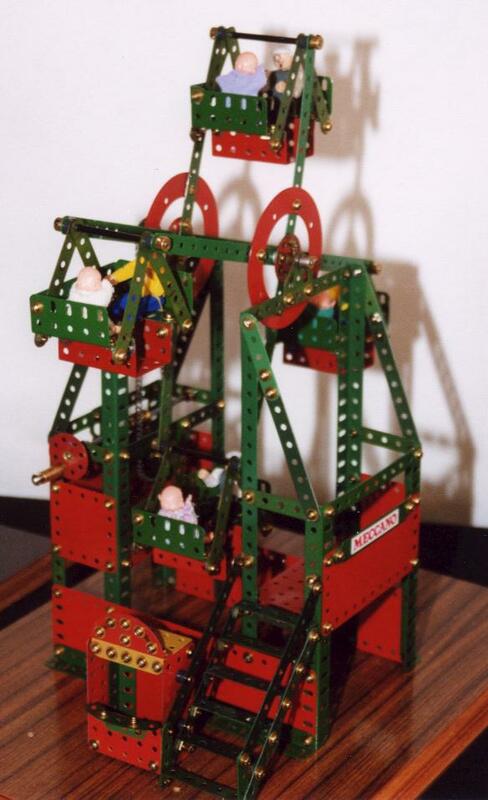 An excellent model Kimball - well worth the 2,000 hours of effort over 12 months spent on its construction! *Rider in the Sky a freelance model that only Kimball could envisage! *Kim Kahn Hill-climb Racing Car - another freelance and attractive model. * Mono-Rail Cyclist - a Bernard P�rier model that was written up in CQ. It ran well and looks nice. * Racing Outfit - a 1929 Douglas 700 cc Motor Cycle Combination. Patrick Russell-Young was only able to come on the Sunday. Once again he had his much exhibited semi-automatic Meccano Loom. As usual this was a great hit with the public - a real crowd puller. Patrick also brought his novelty right angle drive mechanism. Notes by MMC Inc. club newsletter editor Bill Fitzgerald. 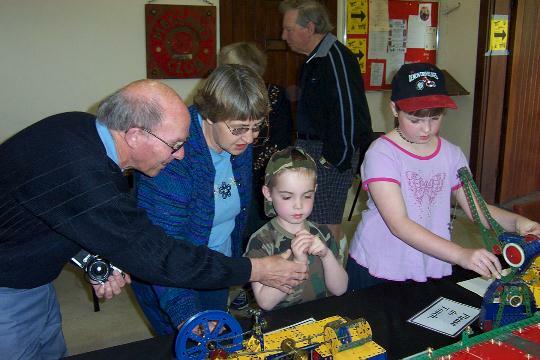 The exhibition was an outstanding success and for the first time was open to the public over two days, Saturday afternoon and Sunday 12th and 13th October. 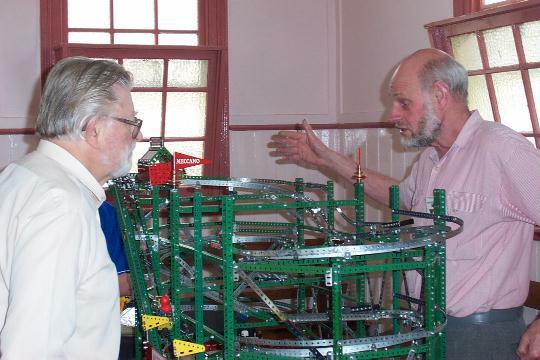 A second initiative was to reserve Saturday morning for Club members, first for setting up the display and then between 10 am and noon to have a relaxed look at the models and general chat. Both of these moves proved very satisfactory - the public turned out in droves and the members liked their own private viewing time. John Riley exhibited two nicely built models from the mid 1950's No 9 manual. 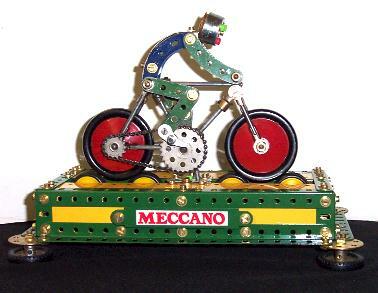 *Magic Motor: -1980's in its Meccano France box although made in Japan. 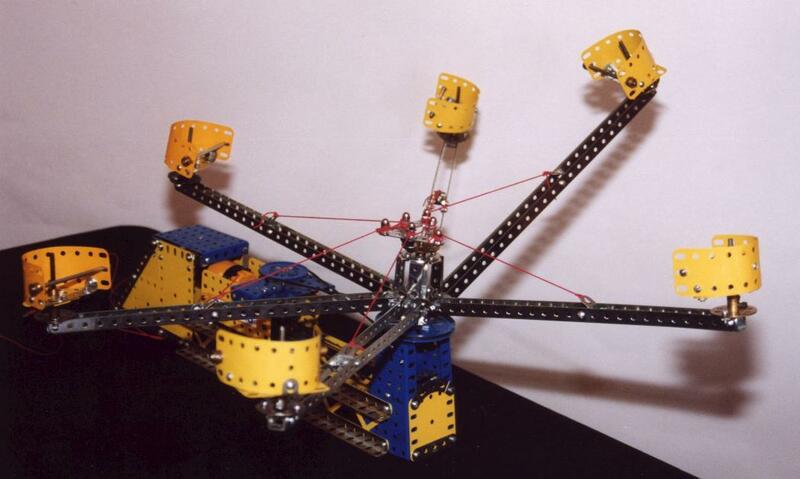 *Ball Roller - based on a design by Dr Alan Partridge described in Constructor Quarterly No. 51 of March 2001. Graham's comments about his model are as follows: "In this version, I have doubled its size, and added several more ball-rolling modules or elements - these are the sometimes tortuous paths through which the balls have to pass before rolling easily along to the next. 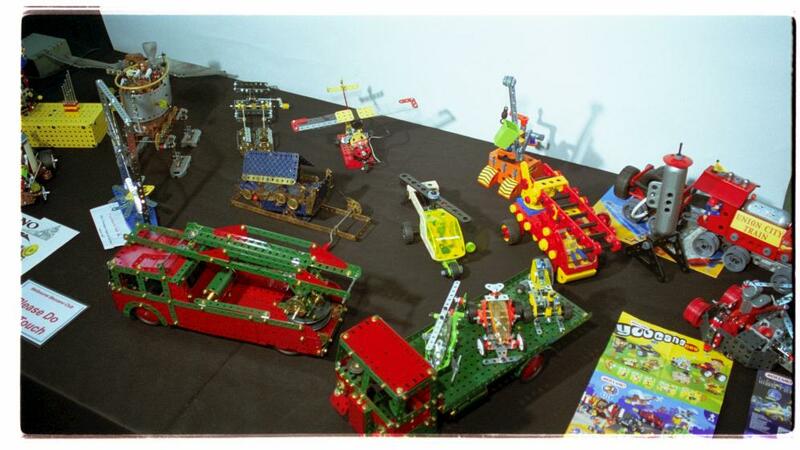 There are nine modules altogether - see if you can spot them all! 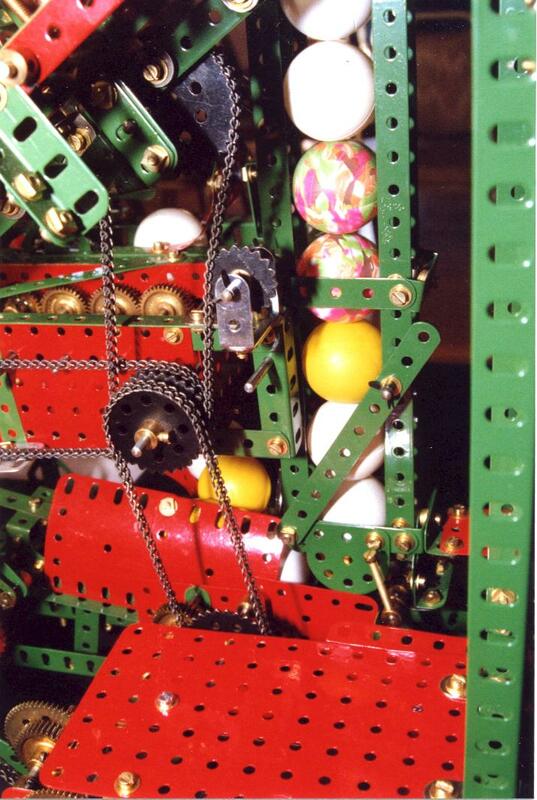 In addition, a ball is fired every 11/4 minutes from one side right over the top of the model to be caught in the hopper on the other side - an occasional wayward ball is not unknown! A total of 38 ping-pong balls is in circulation, and the time for an individual ball to make a full circuit is about four minutes. The unit is driven from a single mains motor." 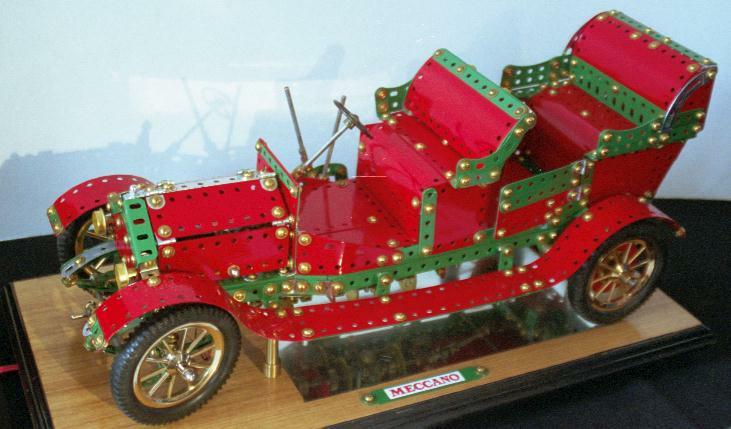 Rather out of place was Jack's fine model of an early Rolls Royce Motor Car. 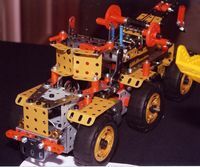 His gear box is described by Paul as "a fun model that might better be described as a "box of gears" arranged in a fairly ad-hoc manner. 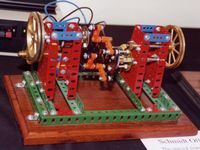 "I built it as an exercise to see how many gears I could reasonably place into a small volume and still make it visually appealing. 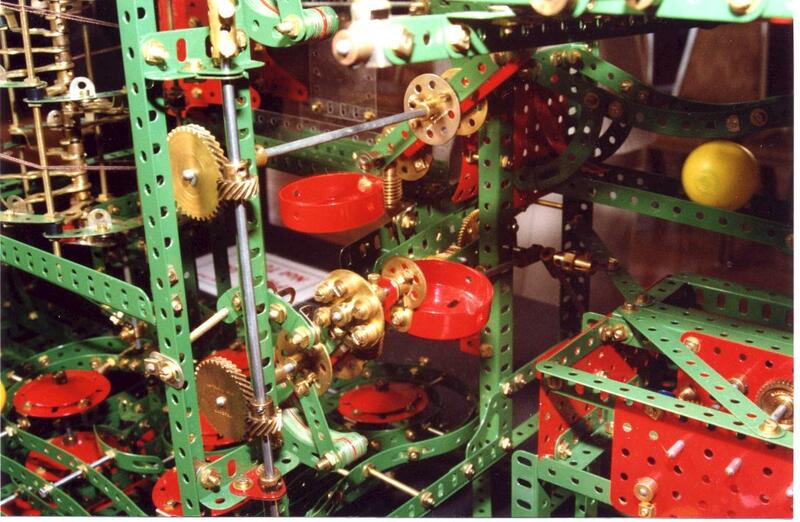 The box consists of a 51/2" cube which contains fifty six gears including all of the Meccano types excepting worms. 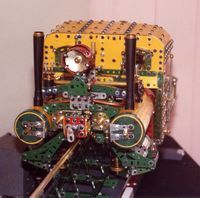 The unit is essentially constructed from two dwell producing mechanisms connected together, to the driving motor and to the "clock" face using a variety of long gear chains." 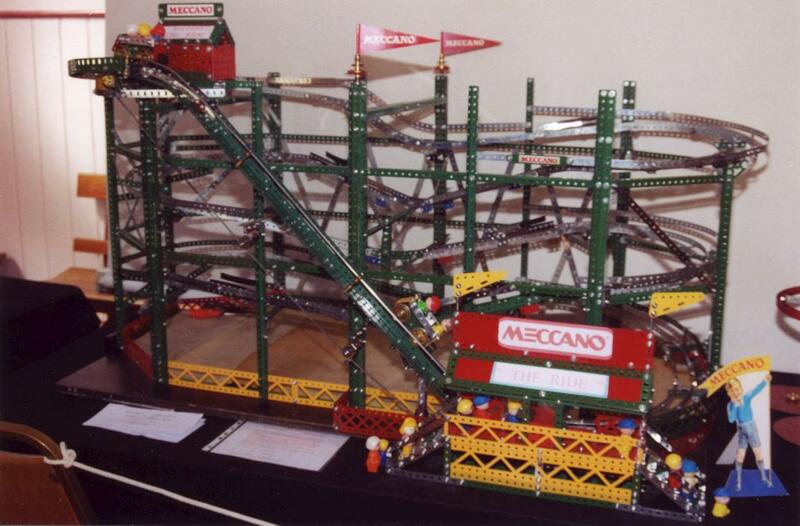 Roller Coaster - around 1.4 m long, 0.7 m wide and 0.7 m high. 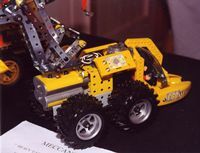 The model was based on one built by Dave Taylor and described briefly in Constructor Quarterly No 24, June 1994. But the instructions did come with the warning .... If you have a weak heart, a short fuse, not much spare time, then don't build a roller coaster. Very sound advice it seems! Dave spent some 150 to 200 hours building the model but says, "even now the passenger cars tend to have a mind of their own, constantly varying in speed and ability to stay on the track." More fine tuning is planned including the addition of finials and flashing lights. 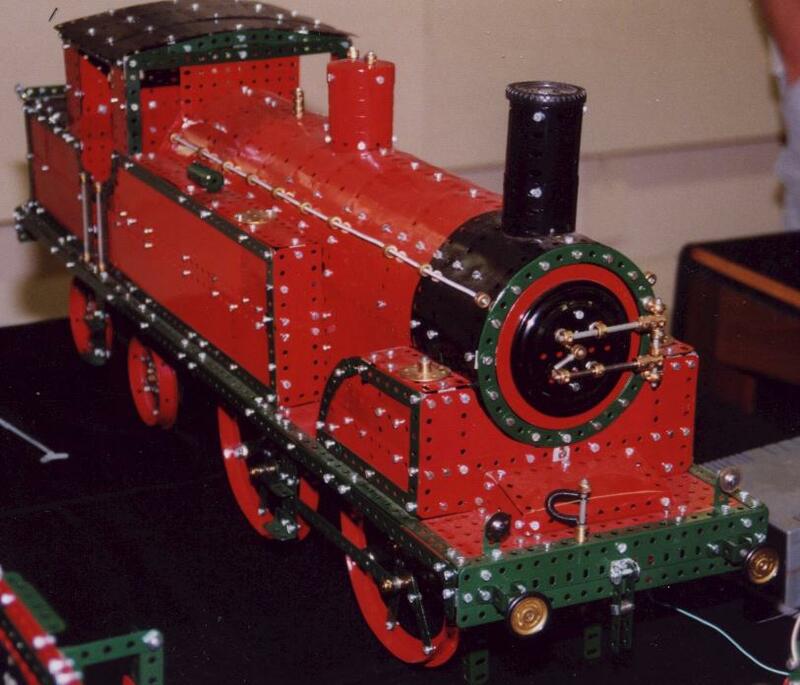 The motive power for this impressive model comes from one small Meccano MO motor! 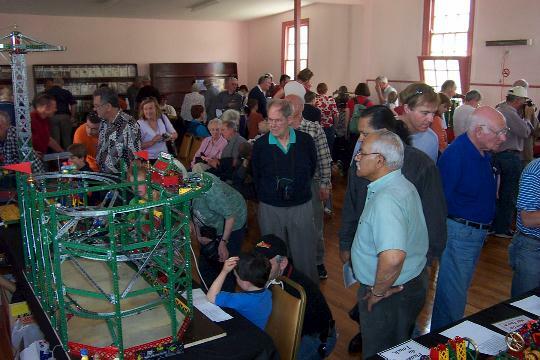 Kimball Monger was demonstrating his representation of the Systeme Lartigue monorail. 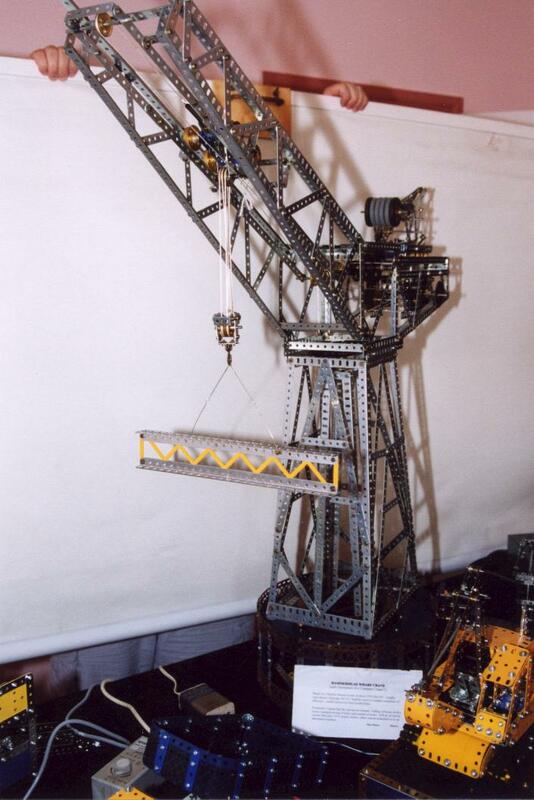 This was a freelance model built to a scale of about 1:10 and is a most attractive exhibition model. It travelled sedately backwards and forwards along it track thoughout the exhibition. 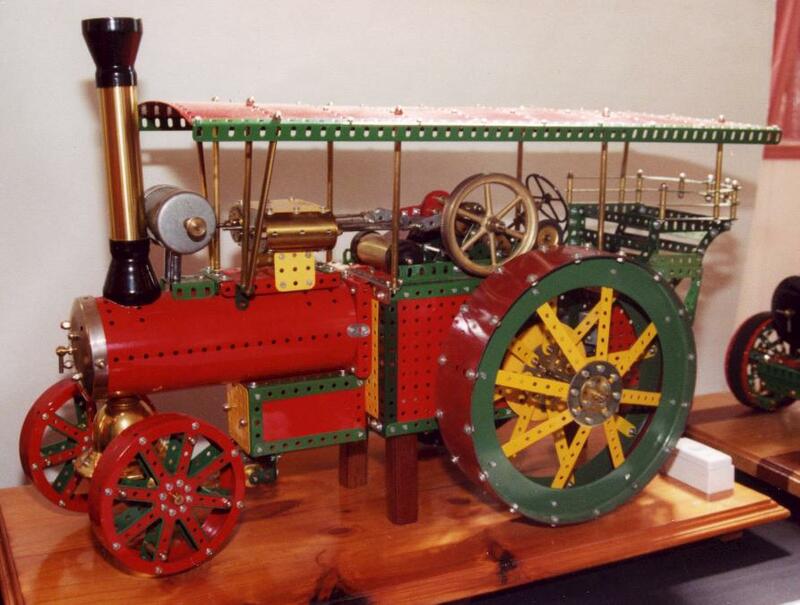 An excellent model Kimball - well worth the 2,000 hours of effort over 12 months spent on its construction! initiative was to reserve Saturday morning for Club members, first for setting up the display and then between 10 am and noon to have a relaxed look at the models and general chat. Both of these moves proved very satisfactory - the public turned out in droves and the members liked their own private viewing time.